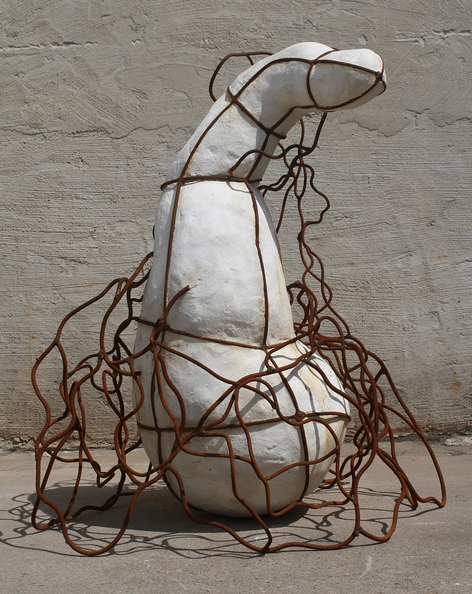 53" x 52" x 27"
JOSHUA PARKER COOMBS' steel and cement sculptures reference living organisms and their basic drives. The forms are simple pods, blobs and larvae, but the scale mimics the human body, making these unsophisticated "beings" into metaphors for the human experience. Energetic steel lines surround the rusted, steel bodies, growing like vines or crackling like electricity. They simultaneously appear to be expressions exuding from the bodies and cages that trap them. 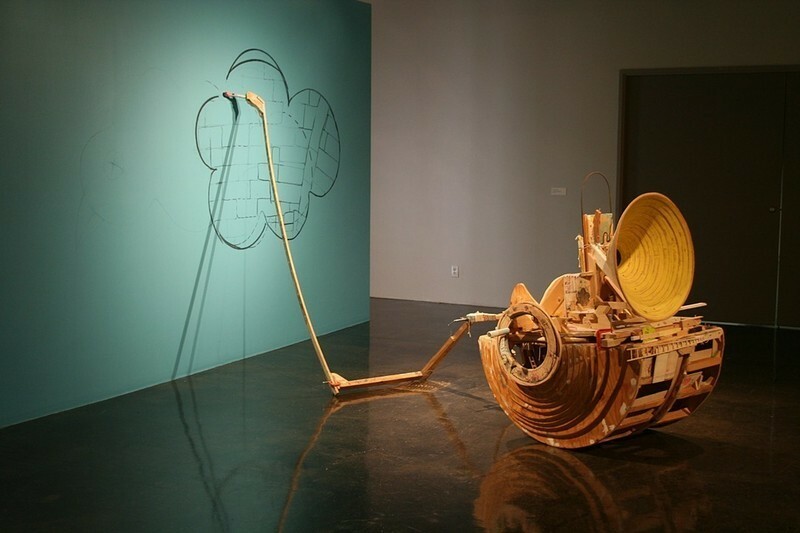 Joshua earned his BFA in 2002 from Maryland Institute, College of Art in Baltimore and his MFA in 2009 from East Carolina University in Greenville, North Carolina. 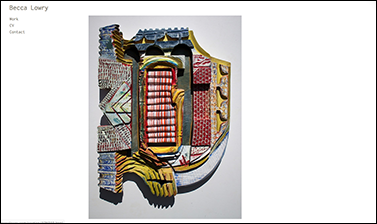 In 2014, his numerous Philadelphia exhibitions include group shows Un/Natural at the Sculpture Gallery, University of the Arts and Presence at Indy Hall, as well as his first solo exhibition From Within at PSG Gallery. 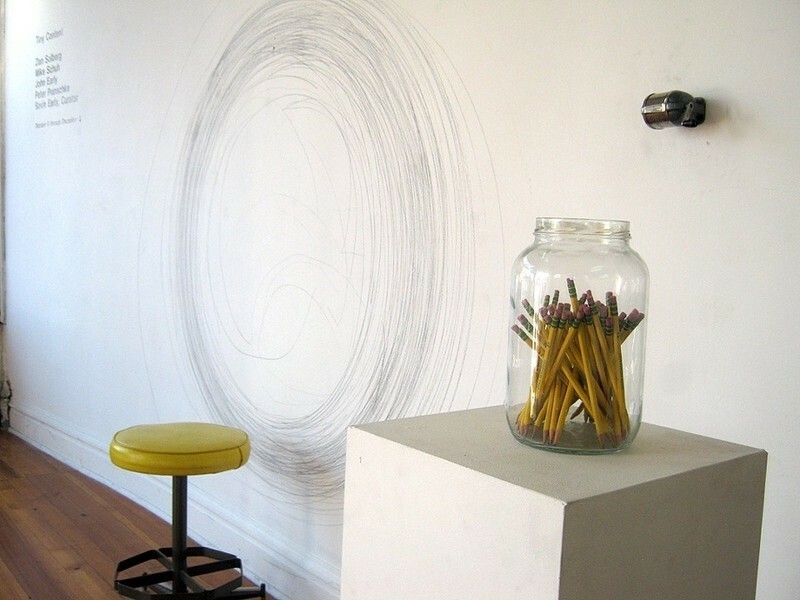 Joshua is currently a member at the Philadelphia Sculpture Gym in Philadelphia, where he lives. OtherPeoplesPixels: Do you think of your work as representational or abstract? Joshua Parker Coombs: I think of it as both. I definitely use certain abstracted larva-like forms to reference human gestures. I also use the annular cell form to represent a rudimentary form of life to convey certain feelings or human experiences. 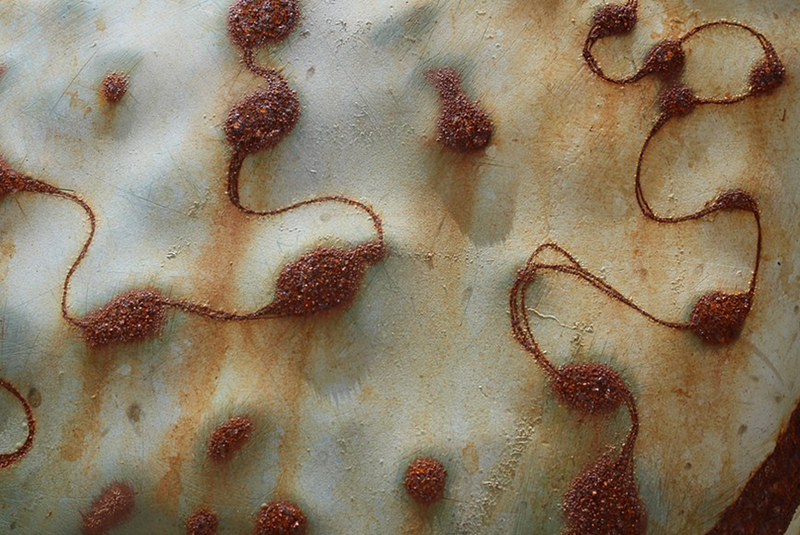 In Shroud (2009), the larva-like form appears to be taken over by the brown cement texture. It’s accepting being overcome by this entity. The slumped gesture is meant to signify this surrender. In Conflict (2008) the cement texture is encroaching from one side and a linear steel element is attacking from the other side. 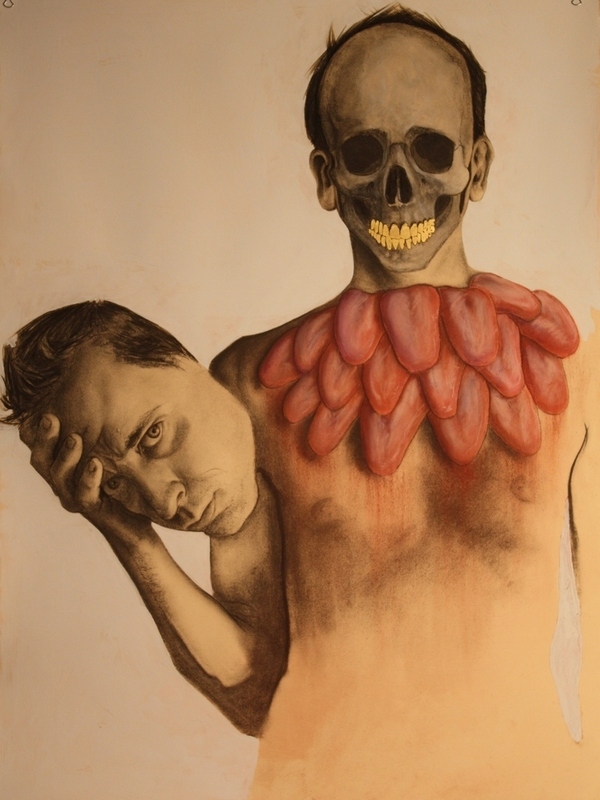 It’s a take on the devil and angel on one’s shoulders and the tension two opposing feelings can create within a person. These forms of basic life are the subjects of the sculptures. I for one often feel like a fledgling version of myself. At times it seems that all of the life experiences I’ve had are never enough, and I have yet to be formed completely. A stripped down representation seems fitting for the fundamental emotions I try to convey. OPP: Tell us a little about the various processes you employ in your work and your history as an artist. JPC: I was fortunate to have many 3-D and Ceramics classes early on in high school and was able to take similar summer classes at a community college. When I was an undergrad majoring in Sculpture, taking Fibers, Ceramics and Wood classes was encouraged. I was fortunate to be able to dabble in those areas. I fell back into Ceramics towards the end of undergrad because of both the medium and the department faculty. In graduate school, I really fell in love with welding steel armatures and experimenting with different materials in conjunction with them. I saw that process as drawing three-dimensionally. The larger scale was both encouraged and more fun. The armatures were pretty quick to build and many Ideas came from using the different materials and seeing how they worked together. One piece would lead to another in terms of materials and concept. 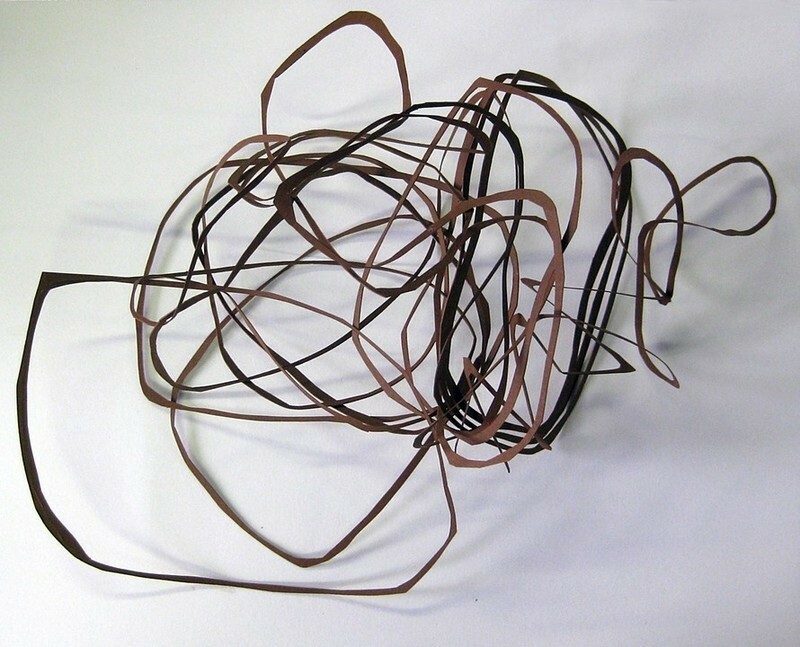 Due to the layering process of using armatures, I developed a theme of conceptual layering. One element would appear to grow into another, and then another element would be growing from it or on the surface of it. This process also forced me to plan pieces out more due to the technical needs of the sculptures and how they would convey my ideas. I enjoyed using fabric with steel and that lead me to try to create a similar feel with the surface bonding cement. I started with pillow forms filling the inside of steel forms. This lead me to create interior hollow cement forms that appear to grow inside a cage-like form. I also attended a leather working workshop, which lead to an interesting process of forming the leather over cement forms I created. My artistic productivity in the last few years is made possible by the Philadelphia Sculpture Gym. This is a maker space which gives me access to welding facilities. This allows me to continue and expand on ideas and themes that I touched upon in my schooling. OPP: In earlier work, there seems to have been more of an interaction between hard and soft, as in Protection/Constriction (2009) and Garden (2007). But in the last few years, you seem to working exclusively with steel, paint, bonding cement and rust. Was this a conscious shift away from soft materials? 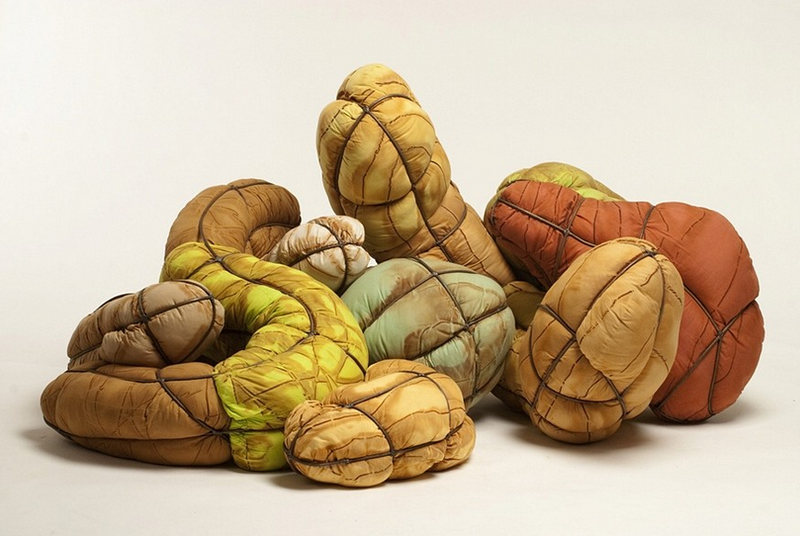 JPC: The textile classes I took during grad school really influenced the hard and soft aspect. But I veered away from that to focus on more durable practices because the possibility of showing and storing work outdoors made more sense. With cement, I was able to create different textures to represent different ideas. 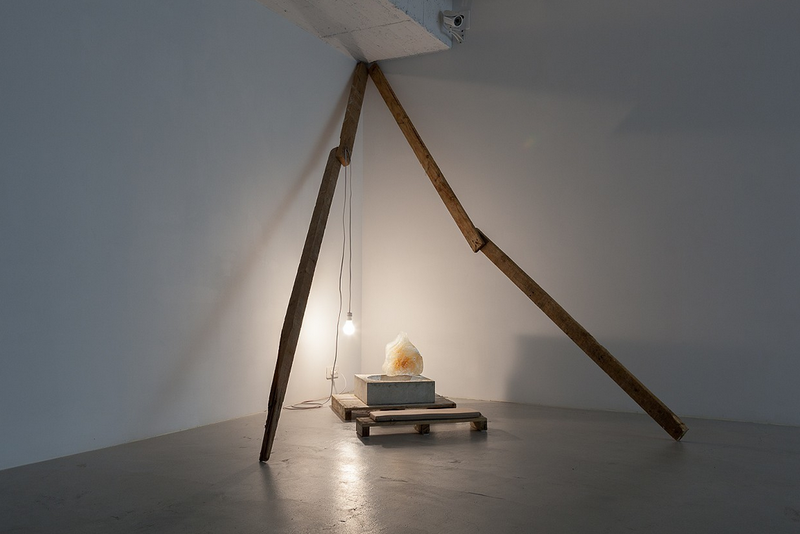 As in both Shroud (2009), Conflict (2008) and also Aura (2014) the blob-like texture acts like a slow-growing moss overtaking the body of the sculpture. I began exploring ideas which required erratic linear steel forms to emerge from other forms as I was able to weld over the cement forms. The energetic steel lines always read to me as a faster growing entity. This is evident in the latter two where the linear element is fighting against the other entity and also growing bigger from within, suggesting a greater achievement. In the piece Stabilitate (2014), I used a smoother, cement texture to simplify the surface, so that the linear element could be the focus. Structurally, the steel lines help the form stand upright, but this metaphorically represents the form finding it’s “footing” through an interior force. 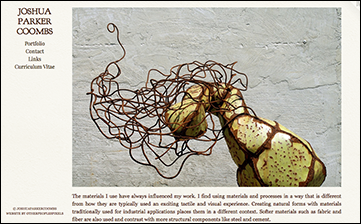 44" x 40" x 41"
OPP: What role does rust play in your practice, both formally and conceptually? 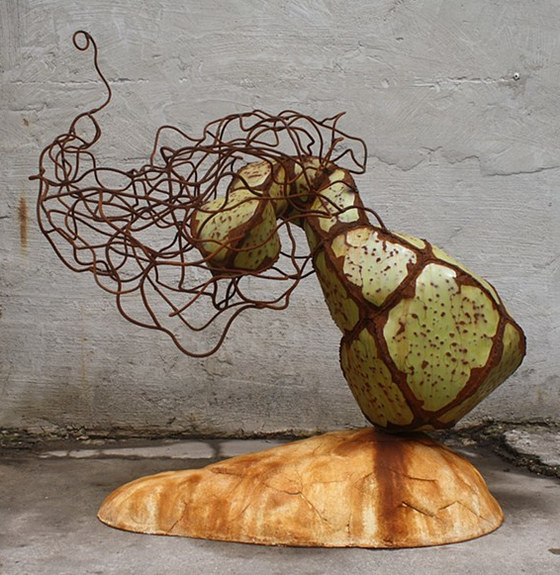 JPC: Rusting my work is a way to make an industrial material such as steel seem more natural and plant-like. It’s similar to creating pattern on fabric and works beautifully with distressed painted surfaces. It’s also just what happens to the material. It’s a natural occurrence. I do force it for deadlines but I like that it is continuing to change as works sit in the elements. Rust is literally a weathered condition and acts as a metaphor for showing age or experience as a being. It also works well with the common themes of growth and change. 65" x 46" x 27"
OPP: In images of your 2009 Thesis Exhibition, most of your sculptures are presented on classic sculpture pedestals, but in other images on your site, they sit directly on the ground. What's your preference and why? JPC: For that particular show, I had many pedestals at my disposal. I also constructed some as a way to get larger heavier pieces into the gallery safely with a pallet jack. It’s always nice to see your work on a “perfect” white box in a white room. But I also like to see them just existing in a space or outside environment. A lot of my work is a combination of “animal, vegetable and mineral.” I use organic forms and gestures, and I often hope there is a suggestion that these things just happened into the setting. I suppose my preference would be—at least at first glance—for the viewer to not even think they were made by an artist, but that they just exist. The “perfection” of a pedestal removes any chance of that happening. To see more of Joshua's work, please visit joshuaparkercoombs.com. 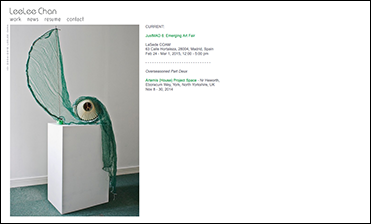 Featured Artist Interviews are conducted by Chicago-based, interdisciplinary artist Stacia Yeapanis. When she’s not writing for OPP, Stacia explores the relationship between repetition, desire and impermanence in cross-stitch embroideries, remix video, collage and impermanent installations. She is an instructor in the Department of Fiber and Material Studies at The School of the Art Institute of Chicago, where received her MFA in 2006, and was a 2012-2013 Mentor-in-Residence at BOLT in Chicago. Her solo exhibitions include I Still Haven’t Found What I’m Looking For (2013) at Klemm Gallery, Siena Heights University (Adrian, Michigan), Everything You Need is Already Here (2014) at Heaven Gallery (Chicago) and When Things Fall Apart, a durational, collage installation in the Annex Gallery at Lillstreet Art Center (Chicago). Form Unbound, a two-person show, also featuring the work of Aimée Beaubien, for O’Connor Art Gallery at Dominican University (River Forest, IL) opens next Thursday, November 5, 2015. 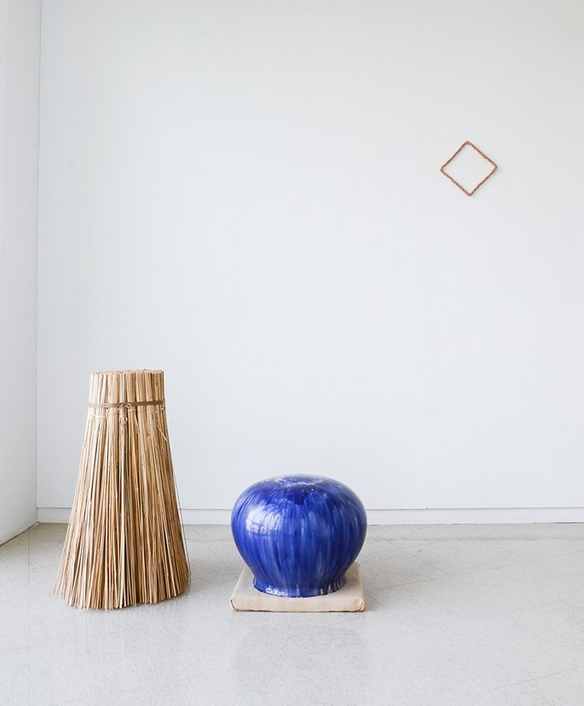 The physics of space, reflection and materiality play into LEE LEE CHAN's intuitive, compositional decisions, resulting in poetic juxtapositions of found materials, both natural and manufactured. 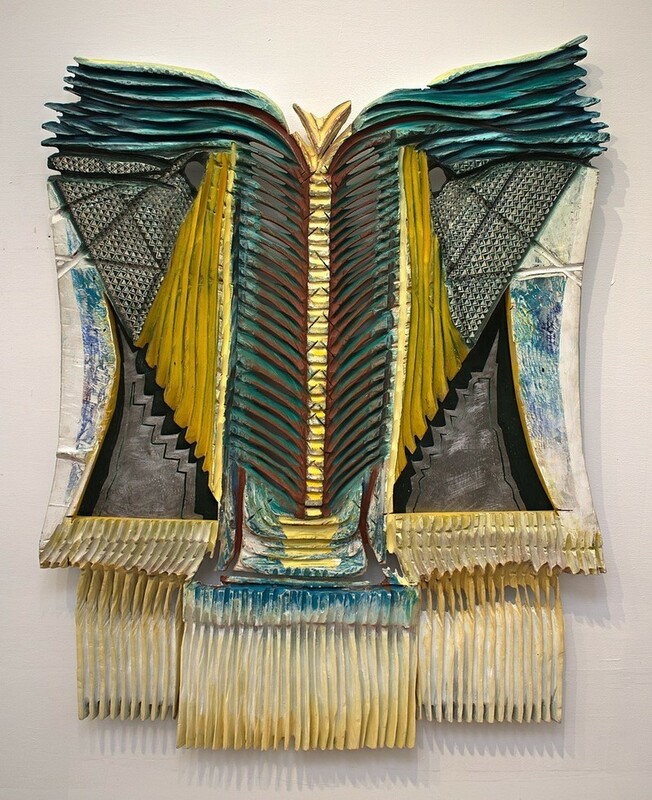 Her background in painting informs her abstract sculptures, and her experiments with objects inform new paintings, creating an endless feedback loop between the two-dimensional and the three-dimensional. Lee Lee earned her BFA from the School of the Art Institute of Chicago in 2006 and her MFA from the Rhode Island School of Design in 2009. 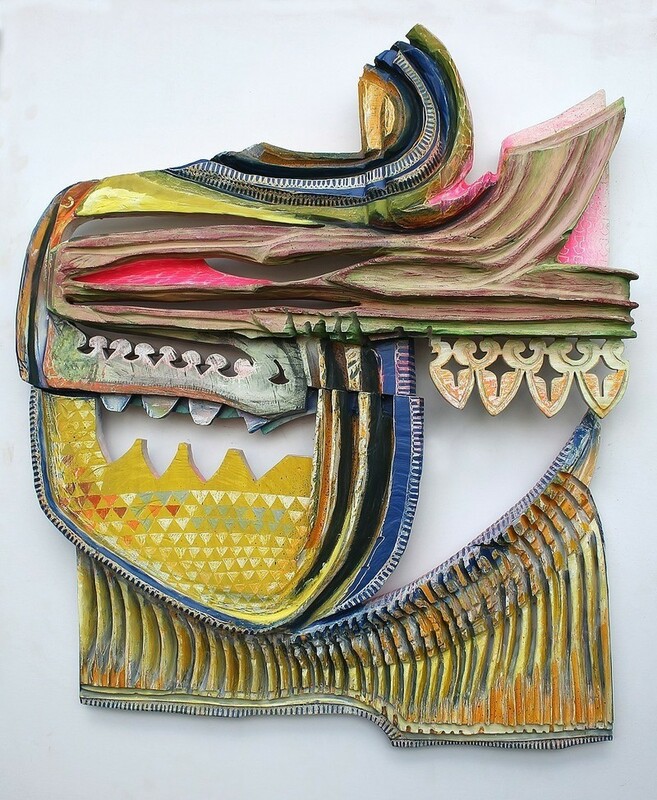 She has exhibited at extensively in Brooklyn: Tompkins Projects (2013), Brooklyn Fireproof (2012 and 2013) and Horse Trader Gallery (2009). 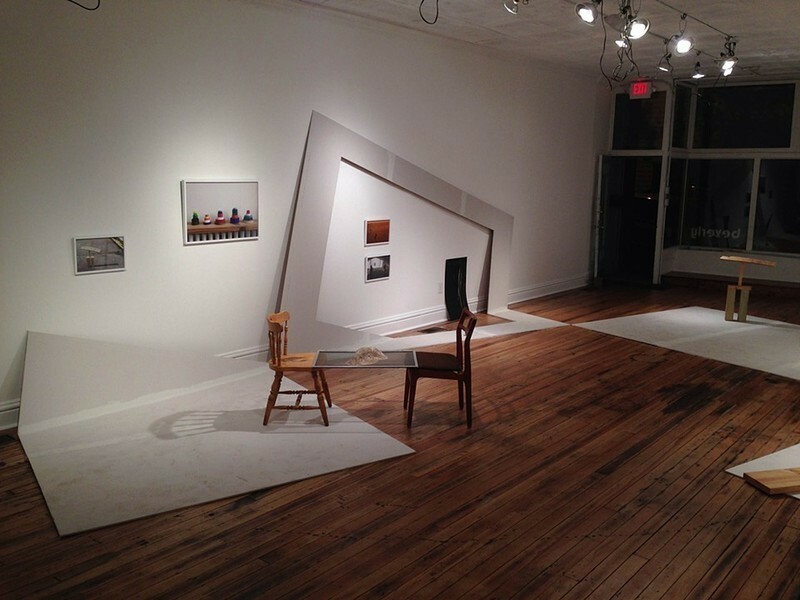 Other exhibitions include Overseasoned Part Deux (2014) at Artemis Project Space in York, United Kingdom, Faraway Neighbor at Flux Factory in Long Island City, New York and Geography of Imagination (2009) at Adam House in New York City. 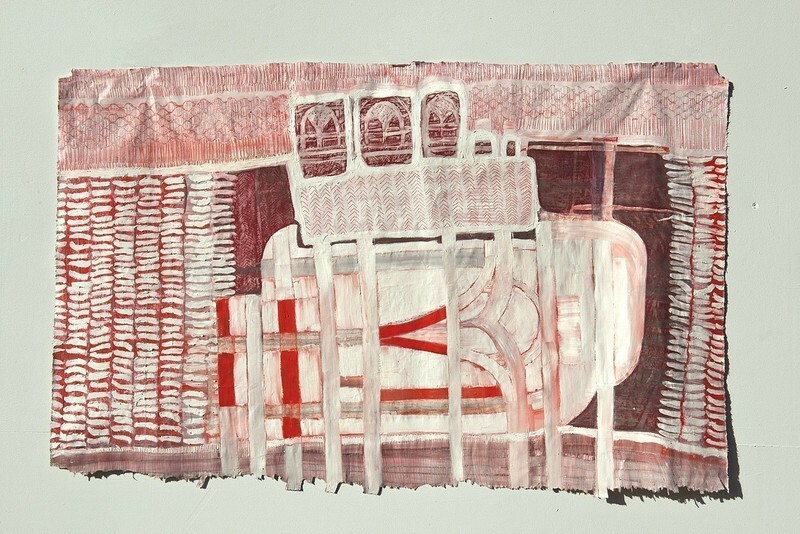 Her work will be included in the Sluice Fair in London from October 16th -18th, 2015, and works on paper are available online through The Dorado Project. After over a decade living in the United States, Lee Lee has set up her studio in Hong Kong where she was born. 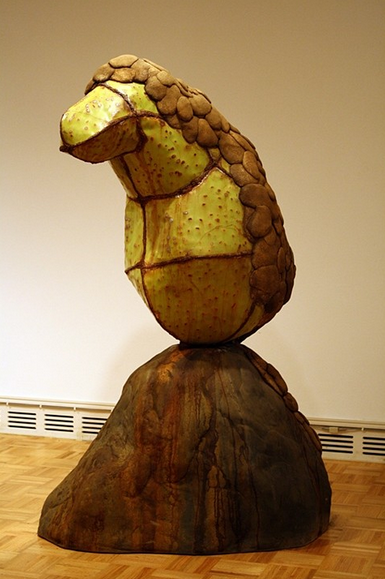 OtherPeoplesPixels: Both your BFA and MFA are in painting, but your sculptural work is so spot-on. What led you to introduce the three-dimensional into your practice? 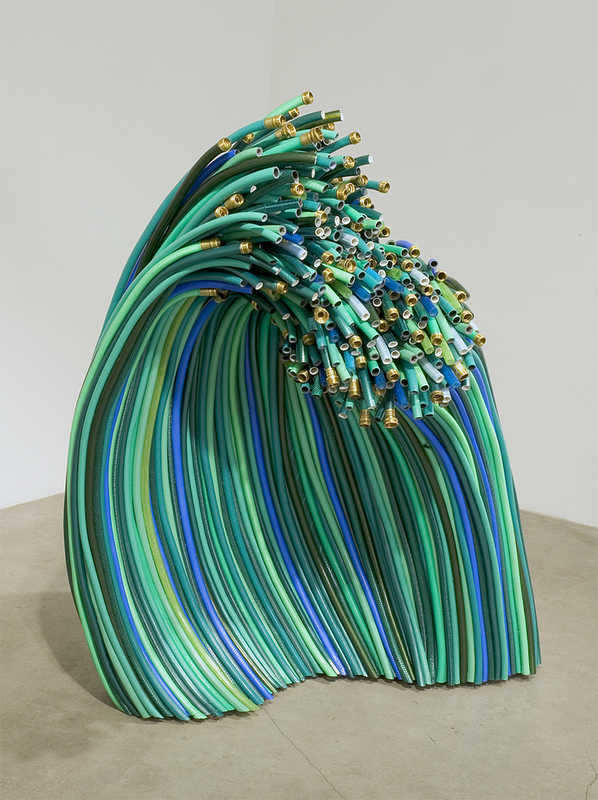 Lee Lee Chan: My transition to sculpture was not a deliberated decision; it evolved organically. When I arrived at graduate school, I was making paintings by piecing together magazine imagery with painted surfaces. However, I found this limiting and did not know how to move forward. 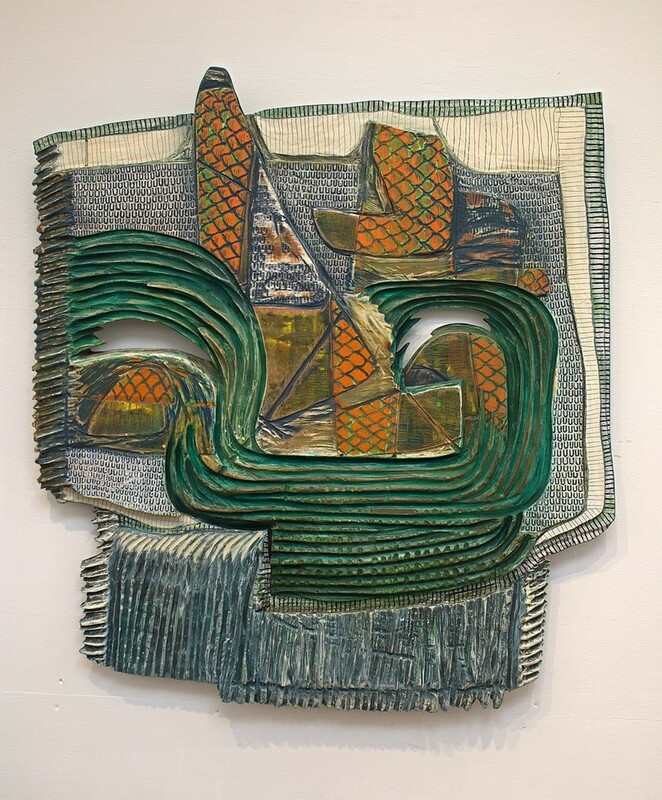 Then I saw a picture of Frank Stella’s paper maquette for Wheelbarrow in the studio, 1986, and it left a strong impression on me. 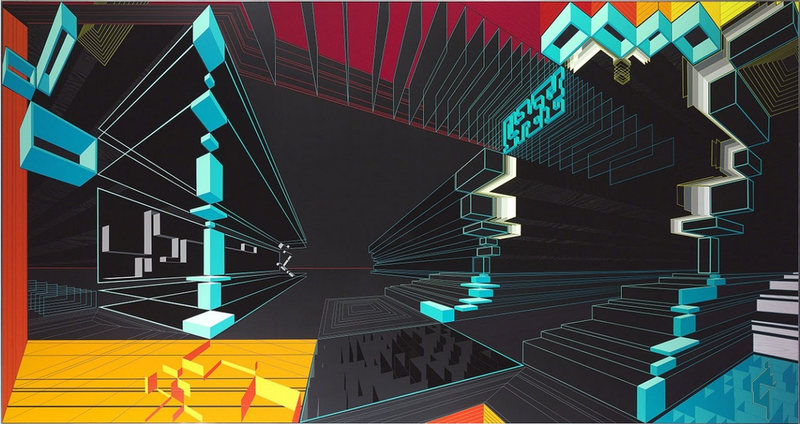 I also discovered Judy Pfaff’s installations, in which she weaved painting and architecture into dynamic spaces. This intersection of pictorial and physical experience and the idea of “collage in space” really opened up possibilities for me. I began making tabletop-sized, paper models from magazine collages, painted paper and photographs, arranging them as a stage for my photograph work. When I began to incorporate more tangible materials such as Styrofoam, aluminum and everyday objects, these models started to have a sculptural presence and took on their own life. This hands-on process of making the sculpture had started to dominate my practice. Having a painting background is both a bliss and curse. I instinctively think of my sculptures as objects floating in space, just like images. However, as they grew more complex and larger, I became more aware of their relationship with the physical matter as well as the space between the viewer and the objects. OPP: Has working in sculpture changed the way you think about painting? LLC: I usually work in discrete phases within a medium. For a few months, I only make sculptures, then the next few months I make paintings and works on paper. Moving back and forth between these media has made me more aware of the limitations and strengths of each medium. It also helps me embrace the materiality of each medium instead of forcing them to do the things that they cannot do. Coming back to painting allows me to take a step back, and I tend to discover things that I did not notice before. Reoccurring motifs always make their way through: underlying geometry, biomorphic forms, motion, light, atmospheric space. 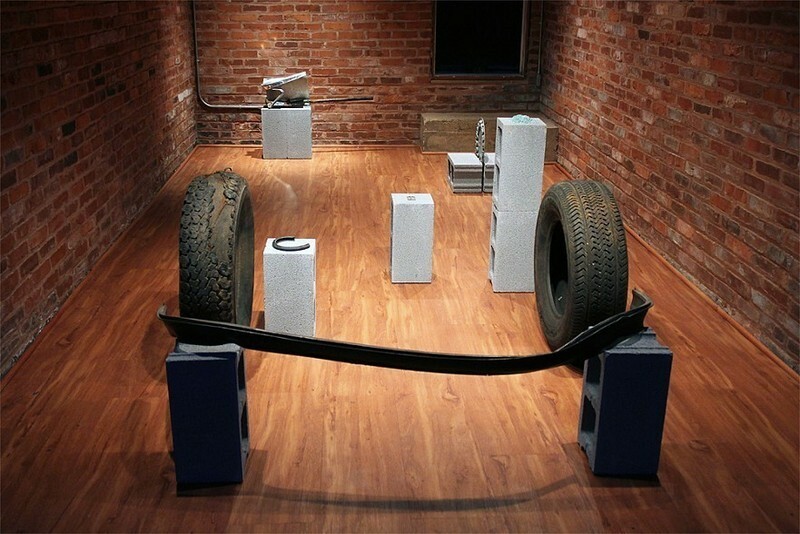 Between the parallel universes of painting and sculpture, all things were interconnected. 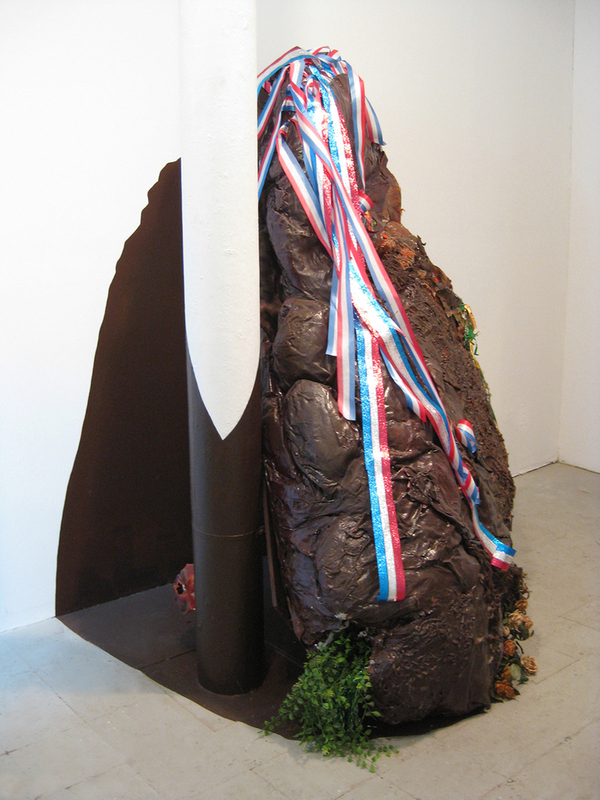 For instance, the sense of object weight in my painting has been directly influenced by my sculpture. And the way I use an intricate system of overlapping to create spaces in my sculpture has affected the way I construct pictorial space to look through and hold imagery in my painting. Generally, I want to generate an intimate perceptual experience that encourages the rawness of seeing. 36 x 25 x 13 inches. 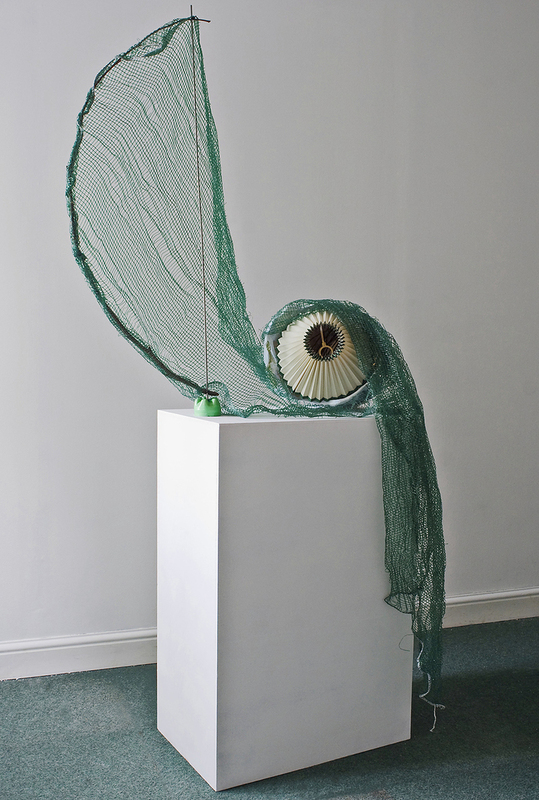 OPP: Your sculptures are often strange and wonderful juxtapositions of natural materials and recycled packaging, as in Keeper (2015) and Bower (2014). How do you decide what materials to work with? What's your collection process like? LLC: My collection of objects has always been a reflection of my surroundings. I grew up in Hong Kong and, since I was 17, have lived in Utah, Chicago, New York City and York in the UK. Both Keeper and Bower were created during the time I lived in York. The dramatic change of environment, moving from New York City to medieval York, where I lived very close to nature, expanded my visual vocabulary. I started collecting tree bark and branches on my walks and experimented with incorporating these natural elements with ordinary objects like garden netting that I purchased from a local pound shop (the equivalent to a dollar store in the U.S.). I found the lamp shade in Bower next to a dumpster in my neighborhood. I tend to collect objects that are mass-produced and easily accessible in everyday life: household items, commercial and industrial materials from the local hardware store, abandoned objects that to me have a pathetic quality. You could say that I collect anything that catches my eye, but then again, I consciously look for objects that do not carry any narrative or nostalgic quality. Any associated meaning gets in the way of my transforming them. 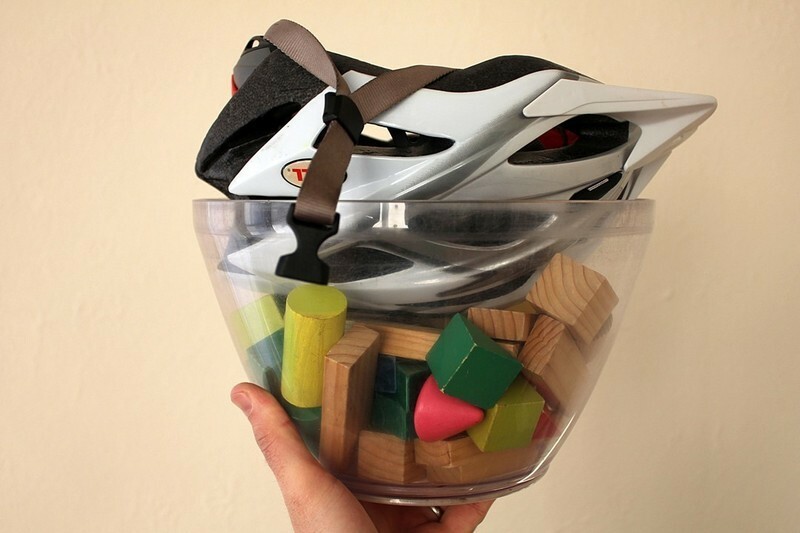 The fact that these objects are so mundane and apparently without value prompts my desire to subvert this hierarchy by altering the way they are arranged and treated. Ultimately, I am interested in provoking uncertainty with these objects: how does something become valuable? Most consistently, I use Aqua-Resin coated polystyrene packaging and plaster to build the structure for my totem-like sculptures. They look substantial but are in fact extremely lightweight, thus subverting the expectation of weight. These materials act both as surface and structure that house multiple micro spaces within the sculpture. They also reveal a trace of my process by highlighting the primacy of the handmade. Aqua-Resin and plaster create a limestone-like surface that reminds me of a construction site or ancient ruins. 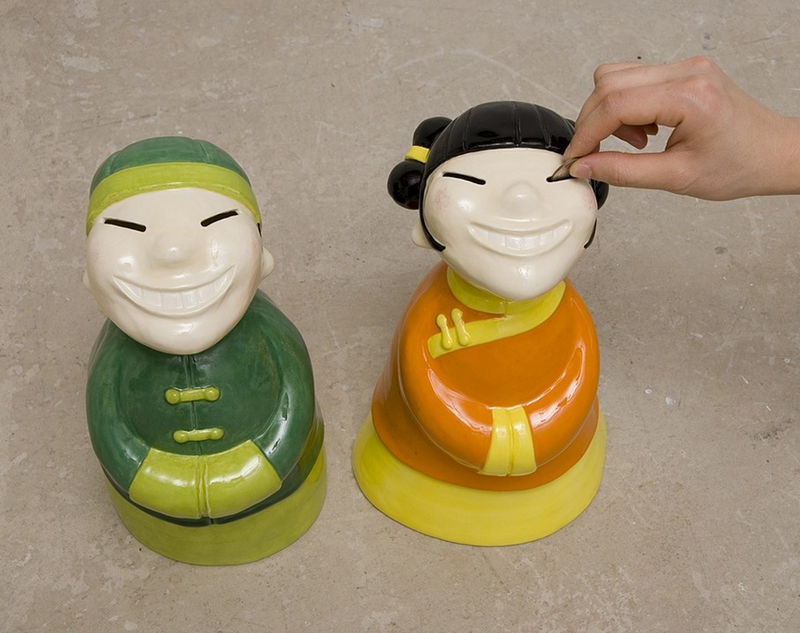 I guess this specific material sensibility came from my memory of growing up and working with pottery tomb figures in my parents’ Chinese antiques shop in Hong Kong. I imagine myself as an archaeologist of the present. OPP: What’s your process like? Do you sketch beforehand or make intuitive moves as you go? 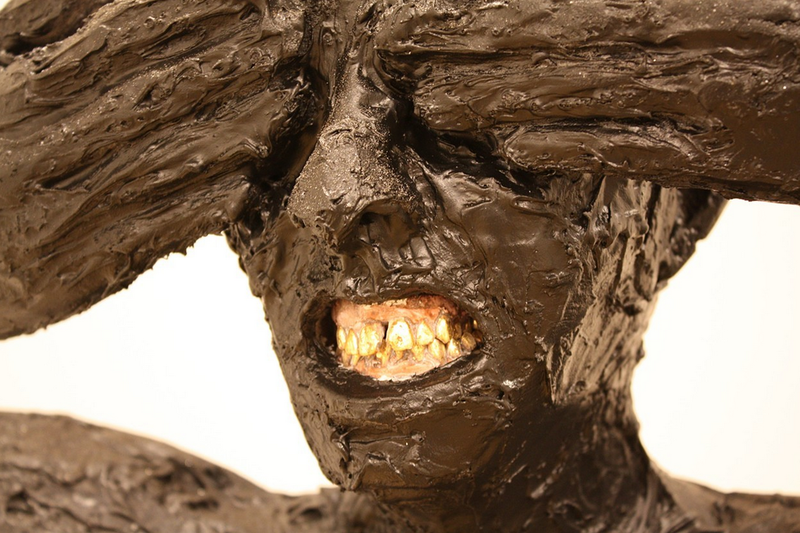 LLC: I see both my paintings and sculptures as a physical embodiment of the inside in a different form. They are a self-exploration of the subconscious. Generally, my works do not start with sketches; rather they generate meaning through the process of making. I am completely open to the process and let my works develop intuitively. It’s a kind of a call-and-response approach, which involves ongoing subtracting and adding until an image or form slowly emerges. The decision-making is at the same time deliberate and improvisational. Ultimately, it is all about potential: I want to make known the unknown and make works that surprise me. When painting, I usually start with a list of colors or a certain mood that I want to evoke. But, of course, everything tends to change once I actually put the paint down. Likewise, with sculpture I begin with materials or objects that trigger my imagination. I spend a lot of time looking at and playing with the relationships between them. Painting is a more direct, internalized process. With sculpture, I am dealing with the physics of actual space, gravity, weight and volume. I often rely on problem-solving experiments to better understand the properties, potential and technical issues of different materials. What are the elastic possibilities of my materials? How far can I feasibly push them? Which properties do I want to embrace? I work towards sculpture that generates its own internal logic, structure and energy, and thus functions more like an entity rather than merely an object. OPP: What role does reflection play in your work? LLC: I want to explore this interplay of space in my sculpture and one way of doing so is through the use of reflections. It facilitates a material shift from the exterior surface to the interior structure, blurs the boundary between inside and outside; between the actual and painted surface. My intention is not to use reflection in a highly technical way to deceive the eyes. I’m not attempting to hide its mechanisms; instead, I am interested in the junction of a pictorial way of looking and materiality of things in space. 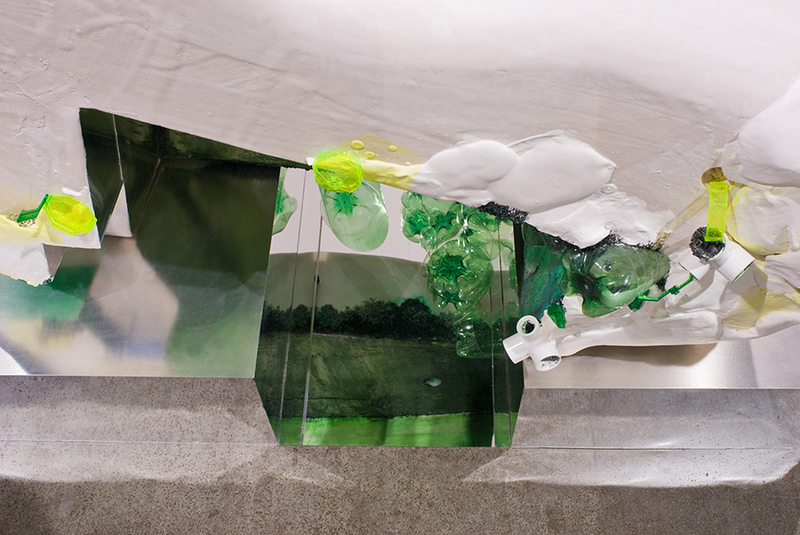 Embedded in my sculptures are micro spaces, constructed either by Plexiglas mirror or aluminum. These materials reflect and absorb the surrounding light, generating a different sense of light for the micro space. This creates both an architecture and a landscape. I always think of the densely layered space in urban environments. In Hong Kong, for example, hidden areas exist everywhere in order to maximize space. I have always been intrigued by the way people expand their everyday, constrained surroundings in an organic and illusionistic way. I want to offer viewers a rewarding discovery by creating work that demands more than a glimpse. I create space that you can either dive into or step back from in order to complete the whole picture. 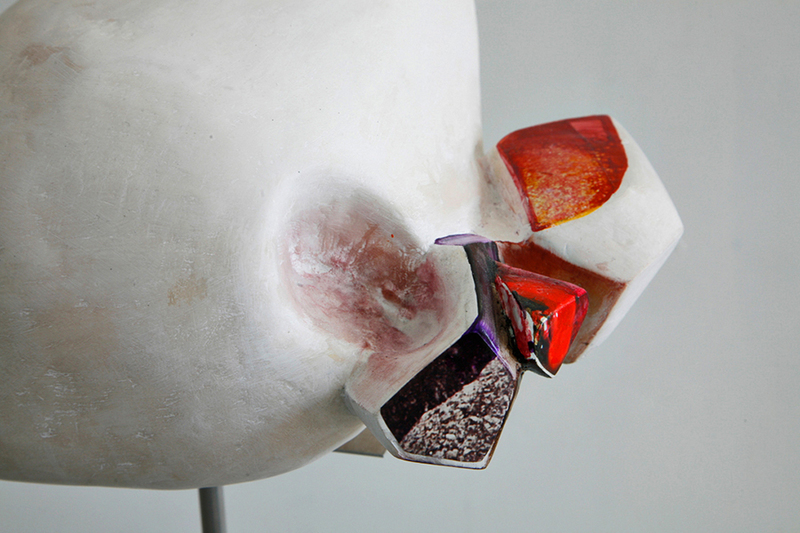 My sculptures generate new meanings depending on the angle from which viewers approach them. The aim is always the same: to evoke the fleeting moments that we encounter in daily life. To see more of Lee Lee's work, please visit leeleechan.com. 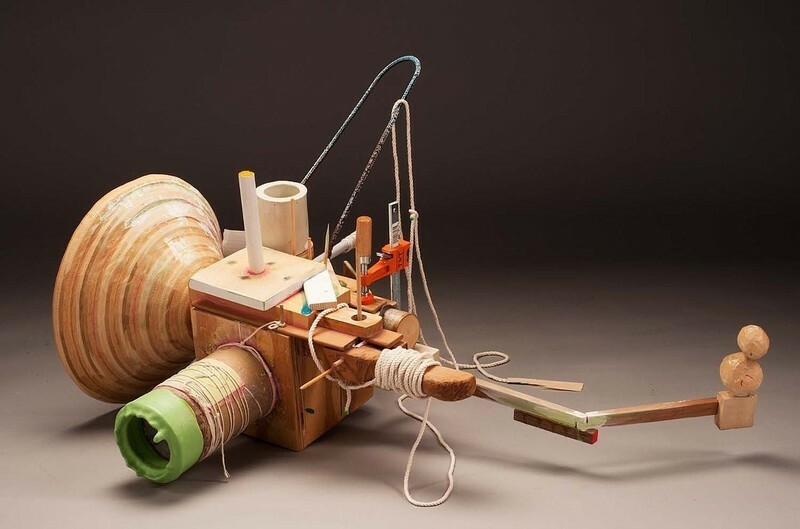 AUSTIN SHEPPARD's mixed media sculptures and drawings are self-reflective and phenomenological in the sense that he begins from his personal experiences as an individual. 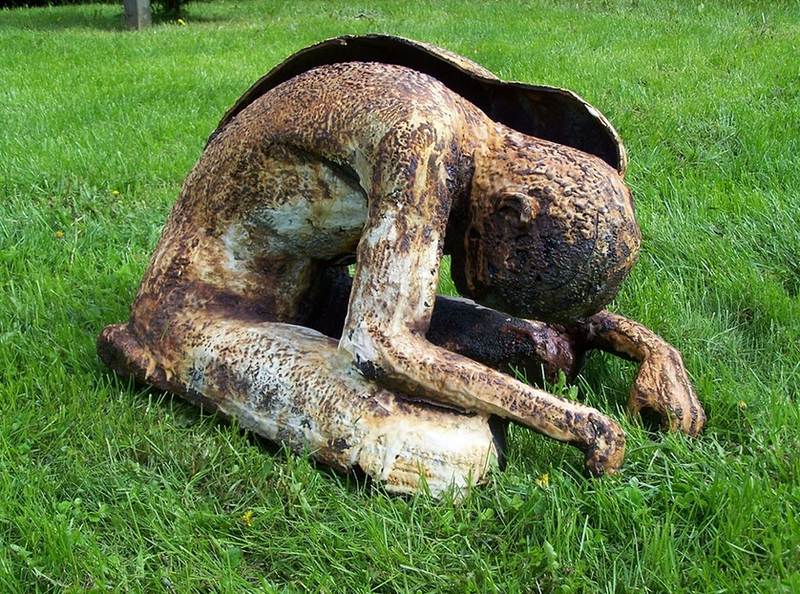 But through the vehicle of the human figure, he also explores the shared human condition by expressing emotional experiences like anxiety, anguish, endurance and resilience. 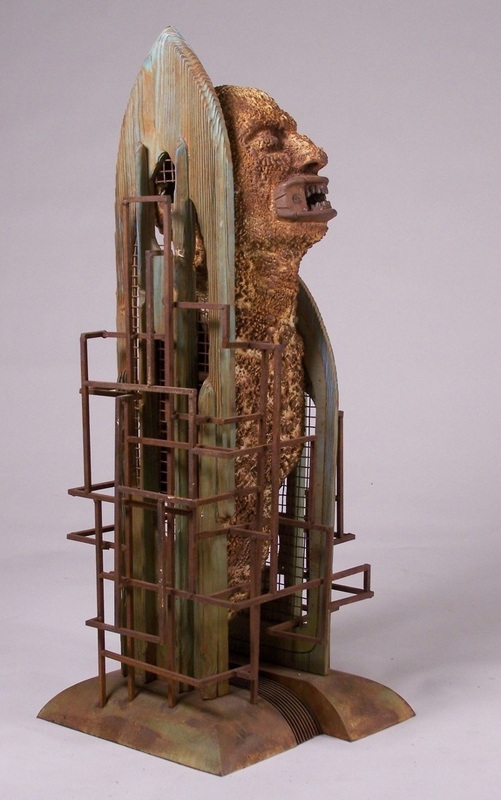 Austin earned his BFA in Studio Art from University of North Carolina, Pembroke in 2007 and his MFA in Sculpture from East Carolina University in 2010. In 2013, he was a finalist in the Young Sculptors Competition for the William and Dorothy Yeck Award at Miami University in Oxford, Ohio. 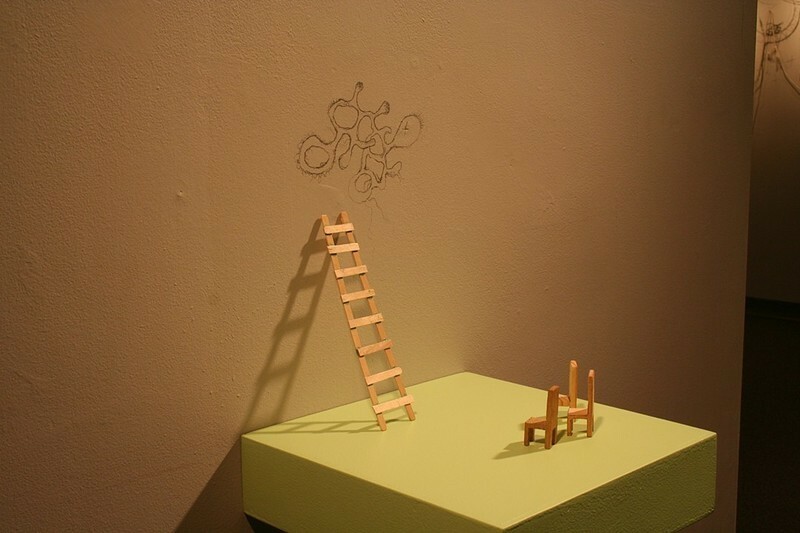 In 2014 Austin exhibited in Lilliputians March at Purdue University and was an Artist in Residence at the Scottish Sculpture Workshop. 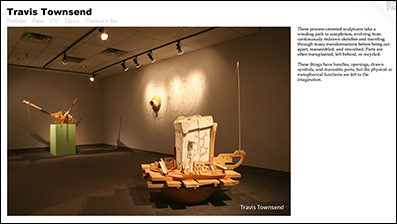 Previously, he's been an Artist-in-Residence at Franconia Sculpture Park (2010), Salem Art Works (2011) and has participated in International Sculpture Symposia in the UK, Finland, Costa Rica and Latvia. Austin lives and works in Davidson, North Carolina. OtherPeoplesPixels: In your statement, you talk about your work growing out of a personal narrative, but do you think of your work as self-portraiture? Austin Sheppard: All of my current work is either a literal self-portrait, or it is designed specifically for me to wear, which serves to alter or enhance my perception of self. While this may seem egotistical or vain, it’s simply the work of a strict individualist and self-reliant person. My work is simultaneously a diary and a therapist, and a perpetual attempt to firmly establish an identity. Its somewhat ambiguous nature (as the viewer is concerned) is a reflection of my difficulties with expressing my emotions to others. OPP: Words that come time mind when looking at the facial expressions of your sculptures and drawings are anxiety, anguish, angst. Is one more accurate than the others from your point of view? AS: I would say they are all equally applicable. I think a lot about the struggles of navigating life as a human, particularly when it involves interaction with others. I think many of us go through periods where our minds are filled with regret, second-guesses and thoughts of missed opportunities. I try to constantly remind myself that these times are temporary, like seasons, and they are also a natural part of life. Though the work seems filled with negativity, the anticipations of better times are tucked away in there, too. OPP: But you definitely don’t explore the joyous seasons in your work. How come? AS: Oh, they are there, just in a more subtle way. For example, if I say there's a "dry season," that implies the existence of a wet season. When Winter is at its coldest, we know that Spring will be coming soon. If I present an empty birdhouse, we think of next Spring when the birds may return. 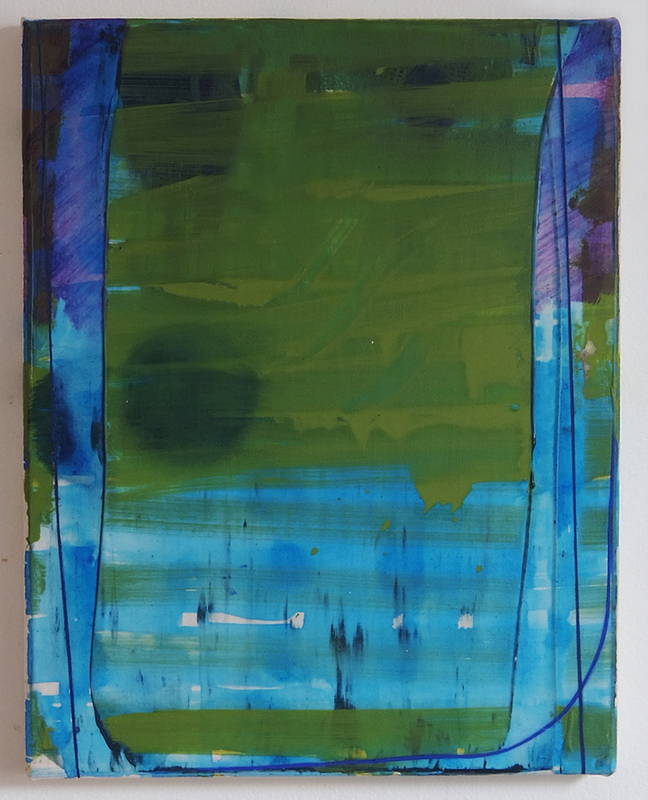 I put indicators of these things in the work, but it's up to the viewer to pick up on them. I will concede that by presenting these seasons in a more desperate manner, we suddenly find ourselves in a holding pattern or a waiting cycle. I think a lot about unfulfilled hopes, the danger of lingering too long and trying to decide when it's time to let go. 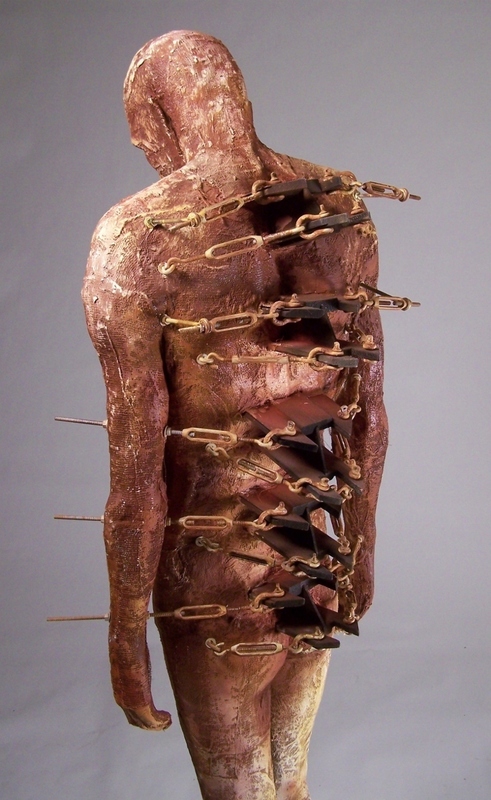 OPP: Your figurative sculptures often evoke torture devices. Often, the body is pierced, as in Model C, or disembodied mouths, hands and heads are treated as relics. While I do read this as metaphoric, I'm curious if horror movies are an influence for you? AS: You’re close! I was raised on Sci-Fi films and TV. Trippy stuff. Fritz Lang’s Metropolis, Ridley Scott’s early films, and Guillermo del Toro’s work are among the most personally influential. Metropolis, Alien, Blade Runner all have a sense of struggle at their core, which is really what my work is all about. They all explore the darkest corners of the human psyche in a variety of ways. The main characters navigate their way through this setting while questioning their assumptions about themselves and others. Another major influence is Mary Shelley's Frankenstein, which is my favorite book of all time. The title character must confront his dark side in the form of a monster of his own making. This is a direct correlation to the way I perceive my work as I'm producing it and my primary motivation for making it. I also just enjoy sci-fi visuals. Del Toro's work is pure eye candy. The elves from Hellboy 2 were really great, and they relate to the seasons that have appeared in some of my work. A new favorite is George Miller's Mad Max: Fury Road. Gorgeous color pallet, and the costumes are outrageous, but in a very practical way. I've started to look at a lot of this stuff as I'm becoming increasingly interested in making wearable work. OPP: Could you talk about the Cathedral pieces from 2009? What is being worshiped? AS: The pursuit of Knowledge. As a kid, I would go visit my grandfather, and he always had a cathedral radio sitting on his workbench. It was a relic of the days when he owned a radio repair business before the war. My Grandpa always taught me to never stop learning. . . and the recurring motif of the cathedral relates to this notion. In my work, this idea is slowly evolving from a personal challenge into the burden of the ceaseless desire for improvement. The idea of never quite being good enough relates back to the anxiety, anguish and angst. OPP: To me, “the burden of the ceaseless desire for improvement” seems like a collective problem exacerbated by our culture. What do you think? AS: It depends on how you define "improvement.” I think most of us don't really know how to find a sense of fulfillment. TV says we need a new car or a larger house; this is really a form of societal peer pressure. So we have learned to equate "more" with improvement, which is problematic in my opinion. I think every individual should define the concept of improvement for themselves. That's what I'm trying to do through my art; I'm trying to figure out what improvement means for me. OPP: What's the role of isolation in your work? AS: It’s a beginning, a middle and an end. It serves as inspiration, response and subject matter. There is certainly a precedent to the idea that isolation breeds creativity, and my most recent work in particular deals with the ramifications of this practice. David Bowie sang about it in Sound and Vision, and of course the Buddha was said to have reached enlightenment only after a great period of isolated reflection. To see more of Austin's work, please visit austinsheppard.com. 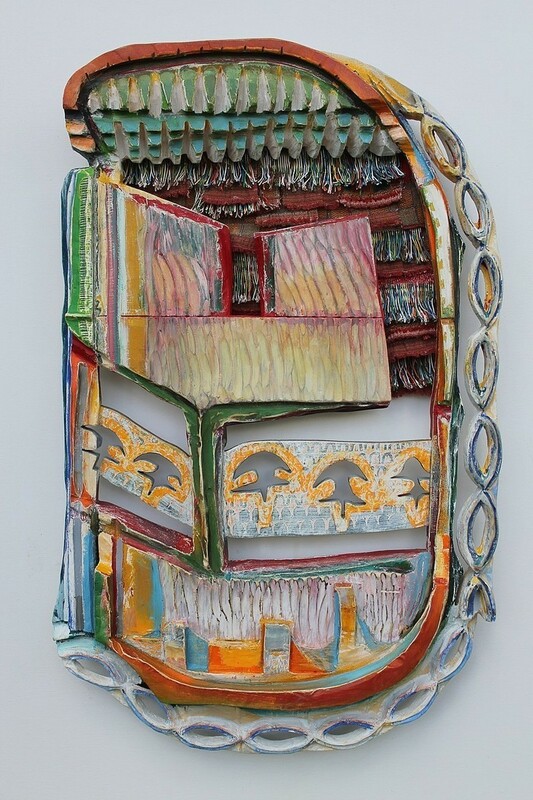 36" x 30.5" x 3.5"
BECCA LOWRY's "carved warrior shields" are a harmonious orchestration of color, texture and pattern. She carves away at planks of plywood with power tools, but the elegance of her final forms belie the lumber yard origins of her materials. 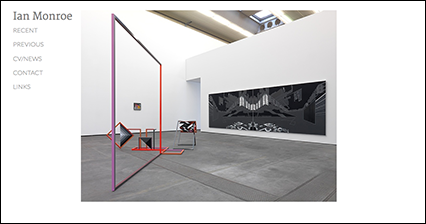 Her exhibitions include shows at David Findlay Jr. Gallery (New York, NY),Jeffrey Leder Gallery (Long Island City, NY), Galarie Zürcher (New York, NY), as well as repeated shows at Fred Giampietro Gallery (New Haven, CT), where she is represented. 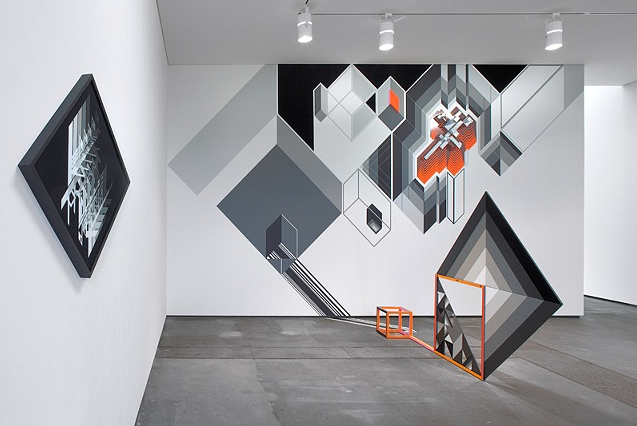 Her work is currently on view until August 23, 2015 in Summerset, a group show at David Findlay Jr Gallery in New York. Becca lives and works in Mount Rainier, Maryland. OtherPeoplesPixels: Tell us a bit about your history with wood-working. Has this always been your predominant medium? Becca Lowry: Wood was ever-present in my childhood. My father is a builder and, loathe to throw anything away, has always kept a vibrant scrap wood pile in the side yard. So I am quite sure that I have made art with wood for as long as I have made art. As an adult, I used plywood as a surface to paint on, in part because scrap wood was free and abundant, but also because I didn’t like the hollow feel of painting on canvas. I painted on wood for many years before it occurred to me to treat the wood as a medium in its own right, to try to carve it. I started timidly by incorporating very low relief carving, texture really, into the surface of my paintings. But as I continued to experiment, the carving became more aggressive and deeper relief until eventually the balance between painting and carving flipped. Although I grew up around wood and woodcarving tools, much of the technique I am using in my work now is quite new to me. 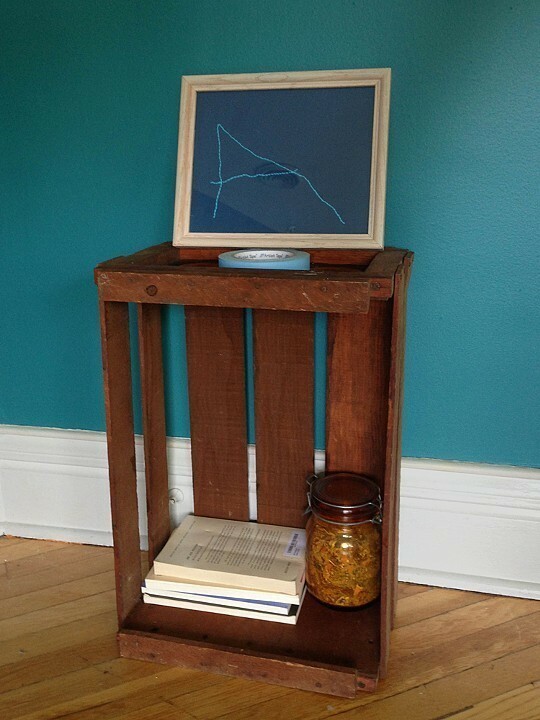 Playing around with scrap wood as a child does not a sculptor make—nor a carpenter for that matter. What I’m doing now is much more akin to wood-carving than it is to wood construction, though there are still built aspects to my process. I’ve done a lot of experimentation over the past years, starting with tools and materials that I am most comfortable with and gradually incorporating input from the woodworking and fine art worlds. 33.5" x 14.5" x 2.25"
OPP: What tools do you use? How do they define and expand the limits of what you can do? BL: My primary tools for woodcarving are a jig saw and an angle grinder, which I use mostly with masonry grinding disks. I use a skill saw occasionally for very severe, straight cuts. For more detailed carving, I use a die grinder and a flex-shaft tool with various wood carving bits. I also have a handful of chisels and other hand-carving tools, but the bulk of the carving is done with power tools. I have a long wish list, of course, but I like to add new tools slowly. Too many new variables all at once can be overwhelming. Each time I add a new tool, my work changes a bit as a result of the functionality of the new tool and the new kinds of cuts I can make. I open myself up incrementally, so as not to get overwhelmed with too many choices. OPP: What role do addition and subtraction play in your process? At what stage does color enter the development of a piece? Is it purely additive, or does it ever get stripped away? BL: Perhaps because I was initially just painting on plywood, I have developed a process of “sculpting” that is in some ways more additive than it is subtractive. At first I was carving low relief texture into one sheet of plywood and then, as I broke through the surface, adding another layer on the back of the first, and so on. Eventually I shifted to a thicker stock of plywood, but I still use the same process, more or less, of beginning the carving in one piece of wood and, as the piece starts to take shape, adding additional layers onto the front and the back. So the piece, overall, gets thicker as I go, not thinner, though I am of course carving away wood as I go. OPP: You also make crayon and pastel rubbings on paper of your sculptures. When did you first do this and why? Was it a practical or a conceptual decision? BL: People had been telling me that my earlier low-relief carvings looked like the block of wood-block prints, and some suggested trying to take prints off of them. I did try but with little satisfaction. Upon the suggestion of an artist friend, I tried rubbings instead and found it to be quite magical. I started doing these rubbings as a compliment to the carvings and a means of having more time to play with texture and pattern. It allows me to select out elements from a carving and reuse those elements in new ways. And the paper pieces are physically less demanding, so when I feel I need a break from the carving, which admittedly is not that often, I can spend some time with paper. Increasingly these paper pieces lead me to new compositions that I’m interested to try out in wood. So the paper pieces may start to be part of a feedback loop of experimentation, where carving informs paper informs carving and so on. 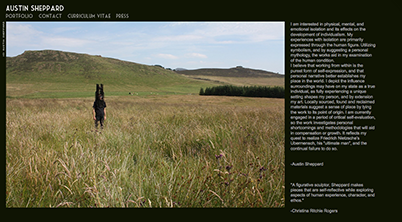 OPP: For me, your work reads more as having a ceremonial/spiritual function, rather than a purely aesthetic one. The tangibility of the three-dimensional texture adds to this sense. Each piece beckons to be touched and used, not simply looked at. 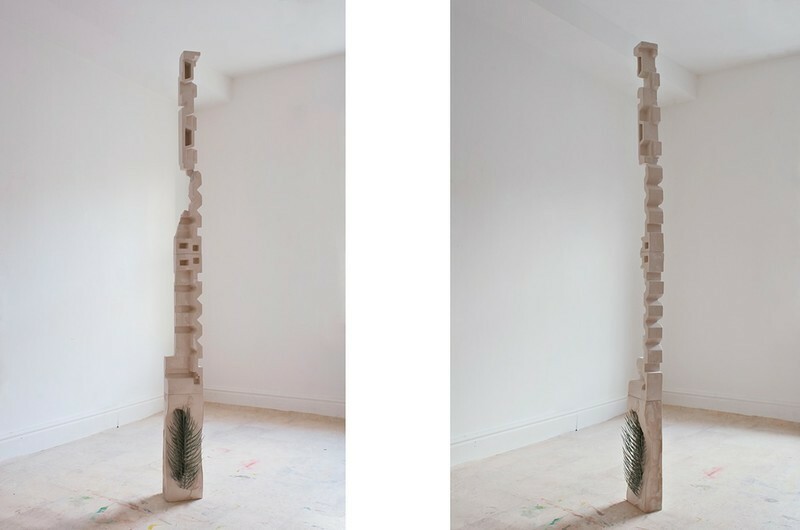 The material and the process carry references to totem poles and carved altars, and occasionally the titles—i.e. RIP 06 and Family Crest—hint at memorial functions. Admittedly, this is my particular lens. . . I'm very interested in the spiritual and emotional functions of art. What are your thoughts? BL: This is really nice to hear. I always enjoy when someone comes away feeling that she wants to hold on to one of these pieces or that the work resonates on some level other than aesthetic. In my head, I’m making modern interpretations of carved warrior shields like you would find in innumerable forms across time and cultures, from Oceania to Europe. Besides the most obvious, G.I. Joe symbolism, there’s a ton of room to play with the concept of a shield. I love that shields operate on both a symbolic and a functional level. For centuries they have not only served as a physical barrier between self and other, but their surfaces have been carved and painted with symbols and images meant to intimidate foes and flaunt the prowess of their bearers. And I love, too, that so much of this flaunting is a sham, that what we think of as bravery is merely fear masquerading. I am both fascinated and confused by what I see as a very fine and shifting line between vulnerability and strength, by the strange truth that often the bravest thing we can do as humans is to expose the most tender aspects of ourselves. These shields I am making try to speak to that, to the relationship between the soft and hard parts of the human experience. Sometimes I am aware of making a shield for a particular person or being, as in the case of the piece you mentioned, RIP 06, which was made in honor of a legendary female grey wolf. But most often I have no idea what particular function the shield will serve or for whom. For me, this is what feels most spiritual about my work: that by some strange alchemy, in the pretend world of my studio, I am forging from wood some very vital protection for some very vulnerable soul somewhere out there in the world. To see more of Becca's work, please visit beccalowry.com. MARIA GASPAR seeks to make "what is invisible more visible, what is unknown known." 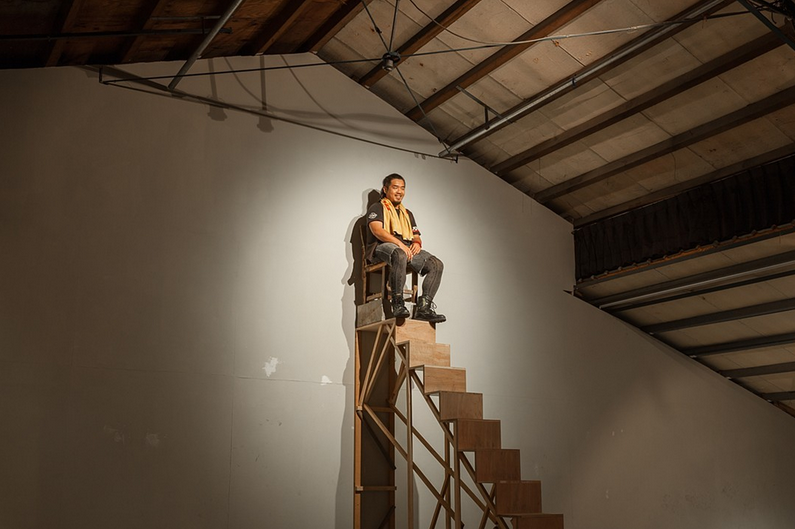 As a studio artist, facilitator, collaborator, performer and audio archivist, she explores power and the social and political meanings of geographic spaces, especially in Chicago’s West Side, where she grew up. 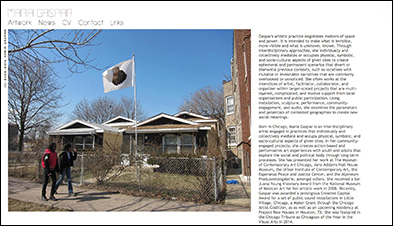 In 2010, she collaborated with young residents (aged 14-21) of the North Lawndale and Little Village neighborhoods in Chicago to create a series of temporary public art projects known as City as Site. Her long-term project 96 Acres is a complex, collectively-produced portrait of the massive Cook County Jail and its effects on the surrounding neighborhood. Recently, Maria was awarded a prestigious Creative Capital Award for a set of public sound installations to further her work in Little Village. She received a Maker Grant in 2013 and was featured in the Chicago Tribune's Chicagoan of the Year in the Visual Arts in 2014. In 2015, she will be in residence at Project Row Houses in Houston. Maria is an Associate Professor at SAIC in Chicago, where she lives. OtherPeoplesPixels: What early influences have impacted your community-engaged public art projects? Maria Gaspar: I was greatly impacted by the work of local artists who engaged young people and residents in a creative process of art-making. In Chicago's mural movement, artists and community folks worked together to represent positive images of their neighborhoods. Spaces like bodega corner stores and community buildings became visual sites for dialogue and civil rights. 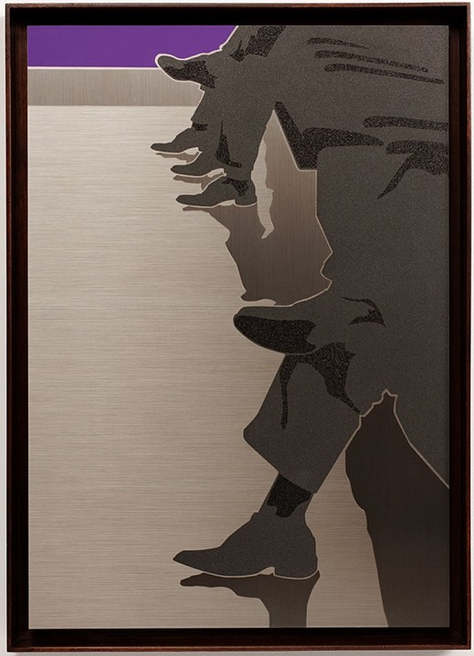 I understand this work as not only having symbolic power, but also political, social and cultural reverberation. This approach continues to influence my way of translating issues around displacement, contested spaces and the politicized body. OPP: Tell us about the public interventions of City As Site. MG: City As Site was very intentionally located on the West Side of Chicago, where I could examine the spatial subtleties around landscape and power with young people within the Lawndale communities. Young people are constantly negotiating their social behaviors within the often-authoritative and oppressive realities of so-called public space and a growing hyper-surveillance normalcy, especially towards brown and black communities. Through City As Site, we created performance interventions with our bodies; mediated vacant lots by way of temporary installations; invented new stories around an isolated viaduct, inserting performance art into the architecture of a bleak space; created drawings on sidewalks using found street detritus; and staged comedic tableaus at the local public park.The most compelling experiences occurred during our daily collective walks as we interacted with architecture through improvisation, where youth made beautiful, poetic, and powerful gestures. At the same time, we also faced misperceptions around our collective walking. What we considered to be a positive and imaginative set of dérives through the city was interpreted as threatening to some strangers. Walking with youth of color became a radical, political act. 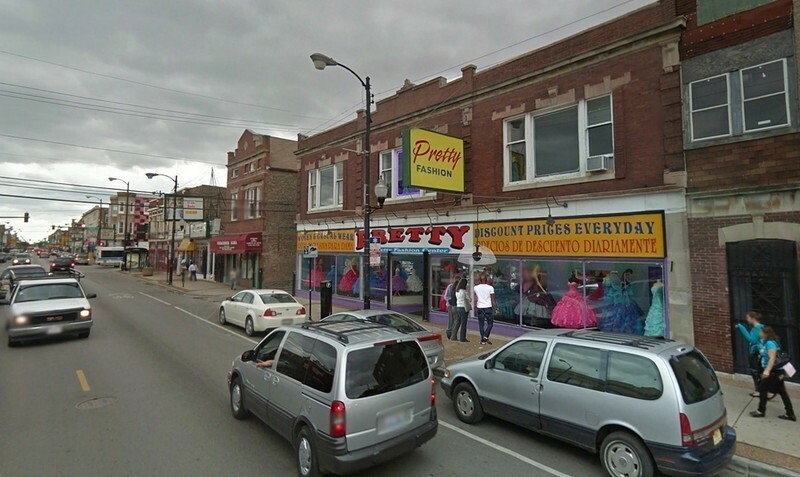 City As Site led to my thinking around specific contested spaces in the Little Village community. In my ongoing conversations with other artists and activists in the area, we speculated about potential art pieces on the jail wall. In 2012, that speculative conversation turned into meetings with community stakeholders, including the Sheriff's Department, and that led to 96 Acres. OPP: What’s been most challenging about 96 Acres? MG: The jail is the largest architecture of my community and grappling with what that means on the social and political level is difficult to say the least. The project begets questions around impacted communities of color, the prison industrial complex, mass incarceration, and works closely with transformative justice approaches. Its complexity is also in its diversity of voices, including an organized 96 Acres Steering Committee and 96 Acres Education Initiative, all facets of 96 Acres that grew out of an organic conversation around the needs of the project. It includes artistic contributions from many other artists and activists around the city and beyond that creatively intervene in the Cook County Jail site using art that engages its surrounding communities. OPP: How does your more traditional studio practice influence the community-based work? MG: My collective projects are durational and community-specific, which entails a lot of time and sensitivity to the conversations that surface through a very thoughtful and open set of questions. This is very different from my individual work where the durational element is in a space of solitude. That space allows me to not only make installations or objects, but also reflect and identify new questions for my work and contend with them. As someone interested in community engagement, the process through which radical community ideas emerge is the most powerful element to this work. I’m influenced Augusto Boal's Games For Actors and Non-Actors and its improvisational methodologies—performance, the body and translation intricately negotiate the gesture, personal and political histories, collaboration and participation. To me, the power lies in the orchestration of situations that create a range of provocative images, interrogate language, and generate innovative ideas. And ultimately, that the spaces I create with others are also spaces for freedom—to be, or to become—fluid spaces of reimagining. OPP: Tell us about your ongoing exploration of the color brown. What does brown mean to you, formally and symbolically, and how have your explorations of it changed over the last few years? MG: The color brown is persistent in much of my work. Originally, I was interested in the way that Chicago's Graffiti Blaster program removed graffiti by covering it in brown paint. All along my neighborhood, I saw patches of small and large brown areas that obscured signs, words or images along viaducts or buildings. The color brown was meant to cover the signs and assimilate into the architectural landscape, but instead the brown color became more visible and the small patches turned into entire sides of buildings. Along with the color, the gesture of "blasting" brown was an interesting act to me. So, I decided to do the same action in an installation at 6018 North, where I spray gunned an entire room brown—ceiling to floor. This action was meant to amplify brownness as an act of power. 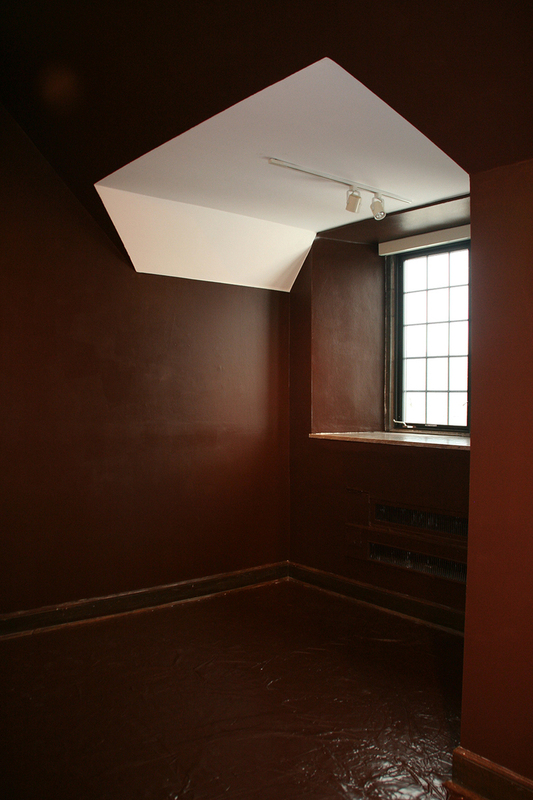 It was about dislocation and belonging and asserting a brown space into what is traditionally a white gallery or exhibition space. In my series of "brown outs," I've completed a series of shadowy forms that conceal and reveal themselves within interiors of buildings. 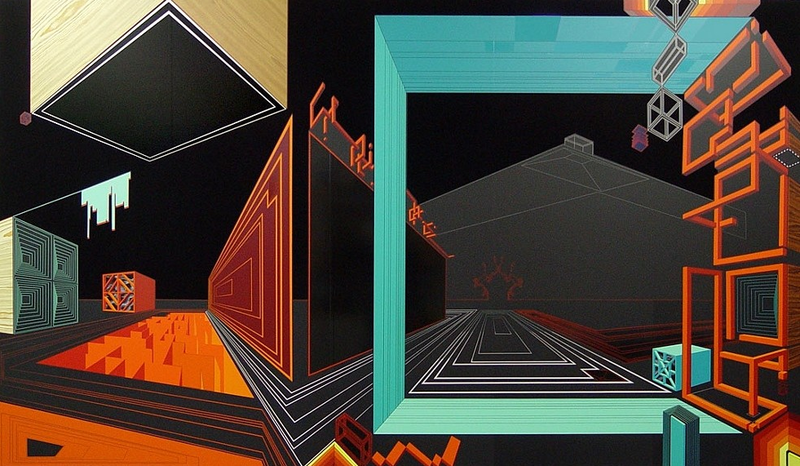 The forms demarcate space and territory and rouse issues of proximity and subjectivity. OPP: I was particularly struck by the documentation of Oblation for Another Parade Performance (2009) at the Museum of Contemporary Art in Chicago. It was sad and powerful to watch how few people even noticed the slow-moving group of people of color. The symbolic social and political implications about visibility and space are clear, especially in the context of MCA's First Fridays. I also ended up thinking a lot about how human beings have different capacities for spatial awareness. In crowds, there are patterns of behavior for claiming and asserting space, which may be culturally conditioned. Some people weave in and out, predicting movements of other people, while others simply plant themselves or barrel ahead, oblivious to the bodies of other people. Was there anything really surprising to you about the crowd's response or lack of response to the performance while it was happening? MG: So much of my artistic practice has used interventionist strategies within public or private spaces. I am often examining the ways that spaces elicit a certain kind of behavior, such as within the confines of a museum. My inclination is to subvert it. I wasn't completely surprised at some of the lack of acknowledgement at the MCA because it was during the First Friday's event, which is like a museum-turned-nightclub. Most people were interested in the socializing aspect of the event, which is exactly why I wanted to create a performance that punctured that environment. The performers made a kind of shape shifting architecture that necessitated an alternate pathway. I was more interested in the ways that people were redirected around the performers and the power that the performers attained as they moved through the first floor of the museum. In addition, the performers were a mix of people, such as modern dancers, a former student who performs in professional drag shows across the city, as well as my community of friends and colleagues who were not experienced performance artists, but enthusiastic and committed to exploring this idea with me. It was a great experience, overall. OPP: In 2013, you produced a short, audio documentary called Cook County Jail: The Visible and the Invisible, which investigated what it means to live next to one of the largest pre-detention facilities in the country. 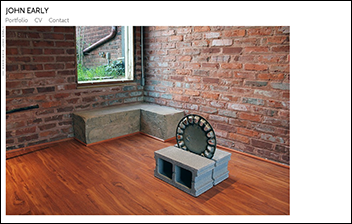 On your website are images of proposals for a series of sound installations based on the proximity of a jail. Have these proposals become a reality yet? Will these sound installations make use of audio from The Visible and the Invisible or have you continued to interview Little Village residents about the jail? MG: The proposals are meant to provoke a dialogue about who sees the jail and who doesn't and why/why not. The idea is to place three sound installations in three parts of a major street, 26th Street (same street as the Cook County Jail), and program them with interviews and personal stories about incarceration. A version of this proposal is currently in development. For now, the audio archive is growing. On the 96 Acres website, the public is invited to upload their personal stories. At an upcoming 96 Acres exhibition at the Hull House Museum (Fall 2015), we will set up a recording table for visitors interested in contributing a personal story. I recently began a residency at the Experimental Sound Studio where I am producing a new set of audio pieces that deal with the sonic landscape of the jail vicinity. I have been documenting the informal architectures of the jail periphery the past few years, which include photos and audio of cultural events located just outside the jail walls, including a recent carnival last week. Audio is a powerful medium that transcends boundaries and geographies and grants the listener the freedom to imagine a space, people and places. OPP: In 2014 you won a Maker Grant, which is cosponsored by Chicago Artist Coalition and OtherPeoplesPixels, you were featured in the Chicago Tribune as Chicagoan of the Year in the Visual Arts in 2014, and you were just awarded a Creative Capital Award. How have these prestigious awards impacted both your practice and your career? MG: Receiving these awards has been a tremendous honor, to say the least. Lori Waxman, who wrote about my work in the Tribune, is a person I greatly respect and admire. Her writing on my practice means a lot to me. The Maker Grant is special because it means that people in my own city have recognized my work as a Chicago artist. Whereas on a national level, Creative Capital has been supportive in funding my long-term art projects that are generally riskier and more challenging to fund. They are willing to take that long ride with me and are invested in all aspects of my creative life. This is an incredibly profound experience that is entirely new to me. I am very motivated by the opportunities and possibilities. I am also very grateful to my friends and, especially my family, that have been there for me every step of the way, and who have indeed been taking that life/art ride with me for a long time regardless of awards or recognition. To see more of Maria's work, please visit mariagaspar.com. LYNN ALDRICH is "seeking a reinvestment in physicality." 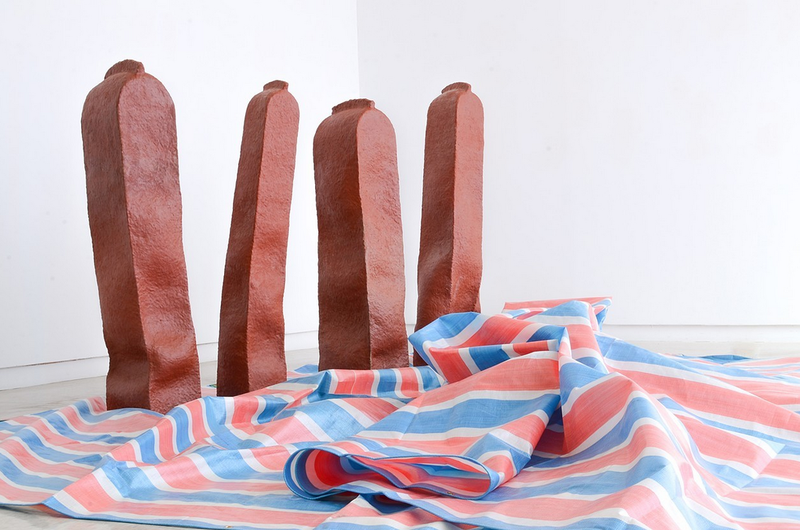 Her sculptures employ the accumulation and organization of found objects and material—often purchased from Home Depot—to reorient viewers to their experience of their bodies. She transforms the excess of mass production into an opportunity for contemplation of our relationship to consumption and its effect on the natural world. 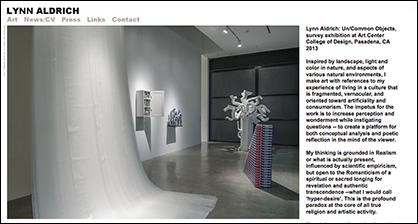 In 2014, Lynn was awarded the prestigious Guggenheim Fellowship, and her work joined the permanent collection at the Museum of Contemporary Art in Los Angeles. 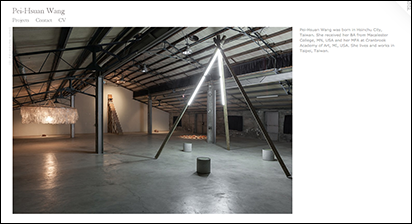 She will debut a major new steel sculpture titled Future Water Feature on July 25, 2015 at Edward Cella Art+Architecture, where her solo exhibition More Light Than Heat will open in October 2015. 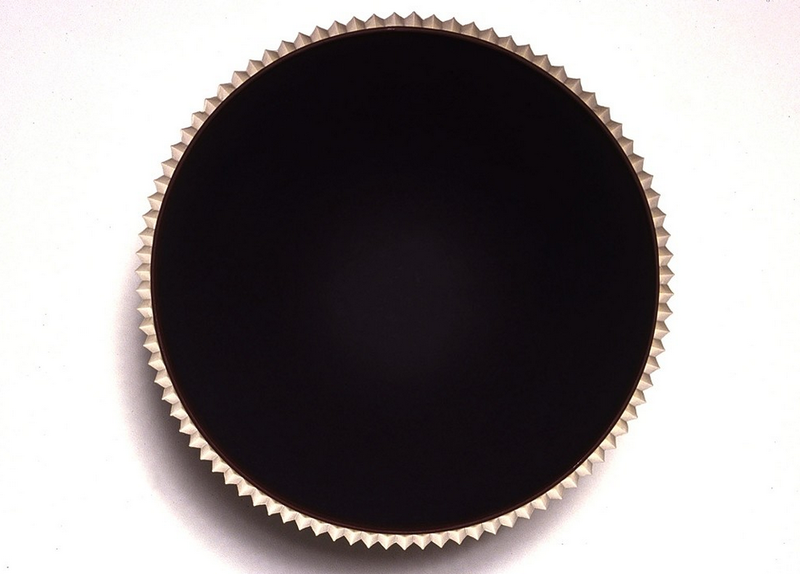 Lynn is represented by Edward Cella in Los Angeles and Jenkins Johnson Gallery in San Francisco and New York. She lives and works in Los Angeles. OtherPeoplesPixels: Many of your materials—garden hoses, plastic tubing, rain gutters—reference the flow of water. Could you talk about this recurring metaphor in your work? 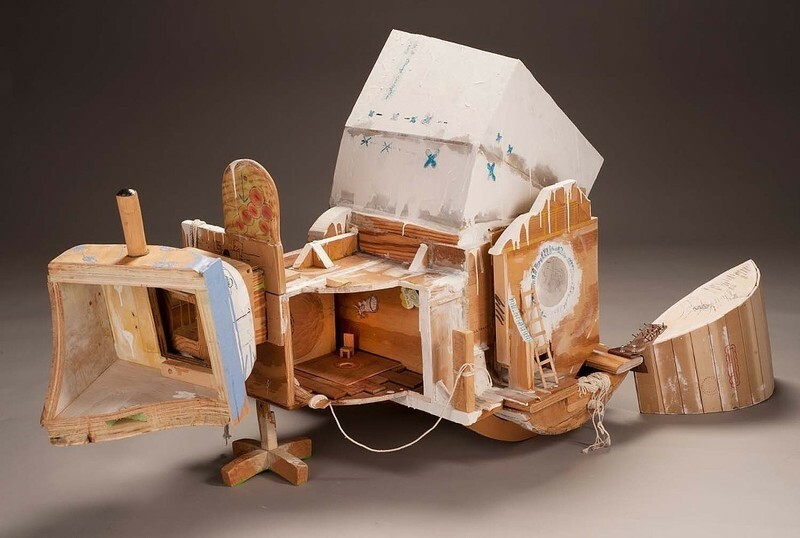 Lynn Aldrich: I wanted to use materials that were ordinary, usually part of a middle class life, which is at times overwhelmed by products and options. From this banal bounty, I decided to select only what carried potential for a kind of revelation. Twenty years ago, we were not so concerned with water environmentally, but it has consistently been a powerful and layered metaphor for spiritual and physical renewal. So water-related materials seemed inherently capable of meeting my conceptual criteria. OPP: What other recurring material metaphors do you use? 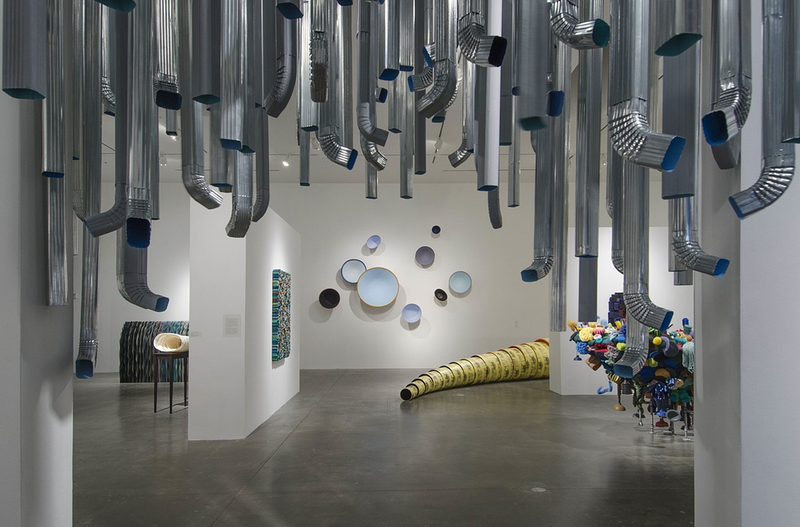 LA: Other material choices also bear some sort of relationship to my observations of and appreciation for the natural world—light and dark and color in the landscape, flora and fauna diversity, cosmic extravagance. For example, in Constellation, I purchased lampshades in various shapes, fabrics and sizes. They already evoked metaphors associated with wonder and transcendence. The decision to fill each one with a modeled, concave center, painted to reference diverse experiences of light, seemed like a simple, direct means to reveal spiritual mystery already present in these objects. 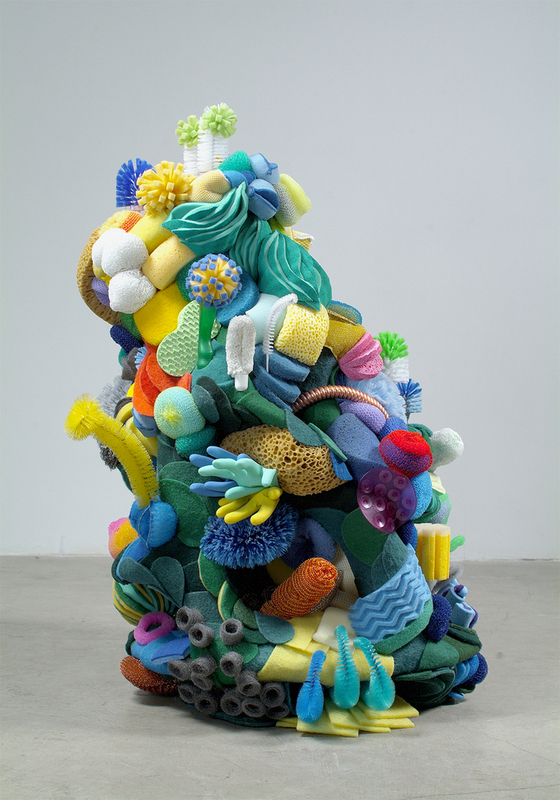 OPP: You employ the strategies of repetition and accumulation in the creation of found object sculptures. Each piece has the potential to go on and on. How do you know when each piece is done? 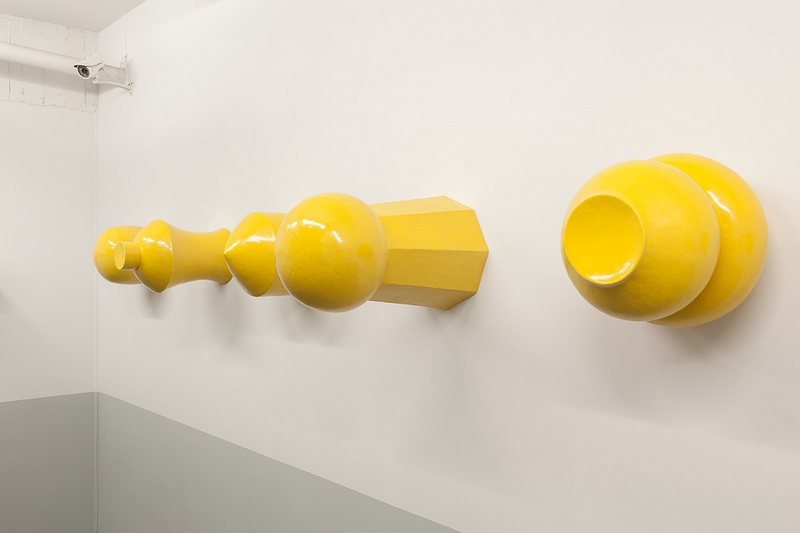 What stops you from expanding these discrete sculptures into immersive environments? 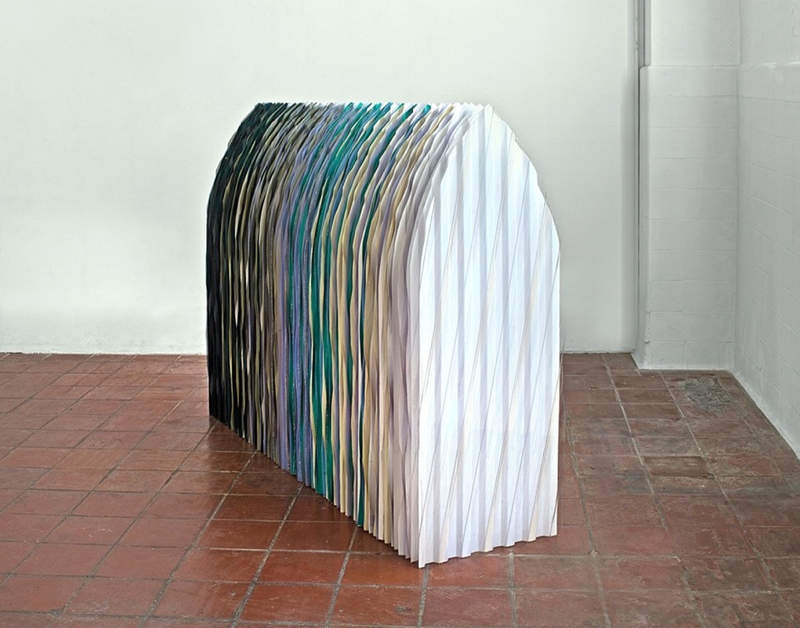 LA: I have a sculptor’s interest in form and differences in scale relating to space. So at a certain point, the quantity of something seems to be appropriate for what the work is intended to accomplish. My artistic choice is to confront, to call the already immersed viewer out of the fog and say, stop, be still, consider this. For me, the repetition is not about infinity, but about revealing paradoxical truths inherent to physicality – something like the New Testament’s concept of Incarnation. This is the idea that God signifies matter, the “stuff” of creation, as good, by entering history in the flesh (Jesus Christ). Artists continually explore this paradox whether they realize it or not—what is obvious and ordinary also bears worth and meaning beyond its material presence. Corrugated plastic panels, fiberglass, aluminum. OPP: In your statement, you refer to a “spiritual or sacred longing for revelation and authentic transcendence” that “is the profound paradox at the core of all true religion and artistic activity.” How do you reconcile that longing with our contemporary consumer society, as represented in your materials? LA: Actually, it’s not possible to reconcile this longing, this desire beyond desiring, with being in the world – therefore we have art and religion. I am using the word religion in its original, etymological sense as from the same root word for ligament, a tie back to God. What used to be the “bounty of nature,” the extravagance we appreciated as coming from God’s provision, we now believe to be of our own making. I walk through the aisles of Home Depot and see products literally pouring down the sides. But am I in a “garden of delights” or a spiritual wasteland? Or as T. S. Eliot asks, can we experience being in the garden even though we are walking through a desert? 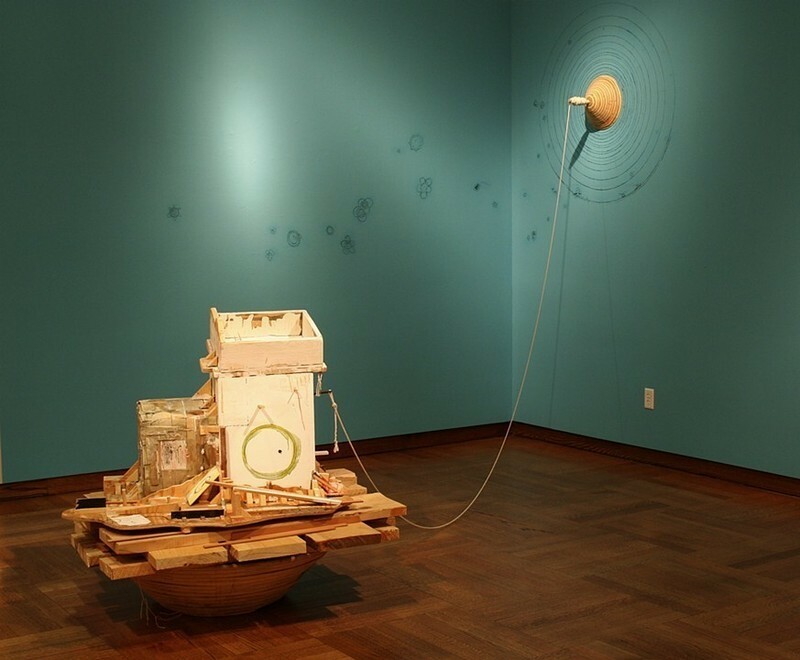 OPP: In 2013, you mounted a mid-career retrospective, curated by Jim Diechendt and Christina Valentine, called Un/Common Objects at Williamson Art Gallery at Art Center College of Design in Pasadena, California. What’s it like to see work spanning two decades exhibited together? Did this lead to any insights about your own work? LA: I can only say that it was an incredible experience. Bringing the works together (many borrowed back from collectors which I had not seen in years) and arranging them in a beautiful, spacious architecture finally produced the immersive experience you mentioned. The curators allowed a kind of “compare and contrast” placement that brought up interesting analogies I had not seen before. Shell Collection is a work from the 90s made from T-shirts dipped in resin, in ten successive sizes from newborn to adult. The viewer peers through the waist or neck and sees a kind of infinite tunnel of “shells” implying one’s passage through life and time. 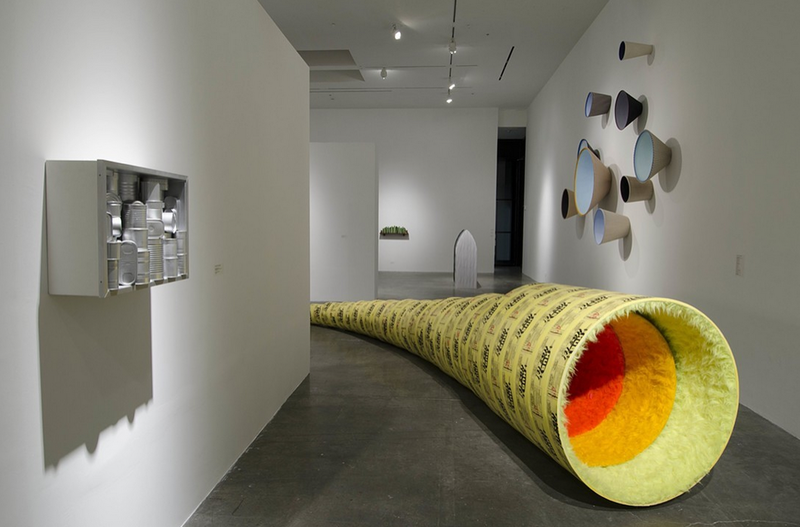 Now this work could be experienced next to Wormhole, a huge nesting of fake fur in cardboard tubes made 15 years later—another compelling tunnel into infinity. I thought these connections existed as I made the work over time, but now I would walk through the gallery sometimes when no one was there and give myself a high five! OPP: What role does mystery play in your practice? LA: My work has a kind of simplicity and stillness that belies the struggle and doubt I often have while making it. For example, in constructing a minimal box out of white, wood pickets titled Subdivision, I began with only one material. I was sure it would end up being white, but at every turn there were decisions to make and problems to solve. How many pickets will reach just the right scale? The points aren’t as sharp as I want, so instead of buying them, do I need to make them myself? How do I put it together and take it apart? The physicality of the thing was wearing me down. I started to doubt it would be anything more than a pile of fencing. But in the end, I felt there was a lovely mystery to the surface of a “community” of pointed wood stakes. Author, Flannery O’Connor speaks of the necessity for the writer or artist to “maintain a respect for mystery.” We live in a material age where science and technology rule, yet there is a throbbing mystery at the core of existence. It’s the role of artists, poets, students of philosophy and theology to wrestle with this. To see more of Lynn's work, please visit lynnaldrich.com.